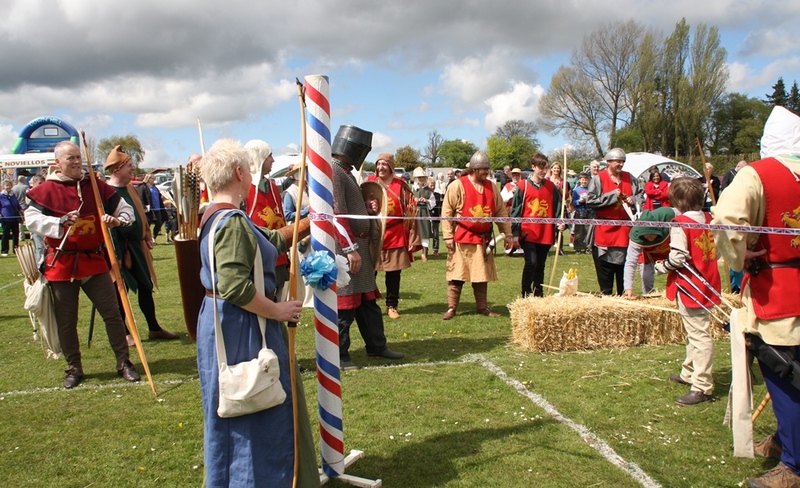 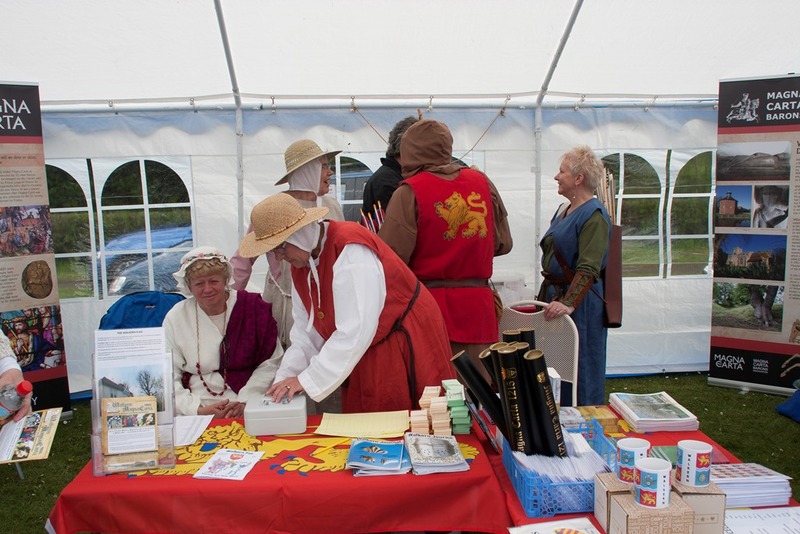 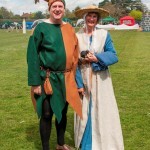 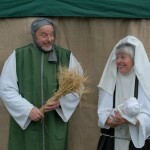 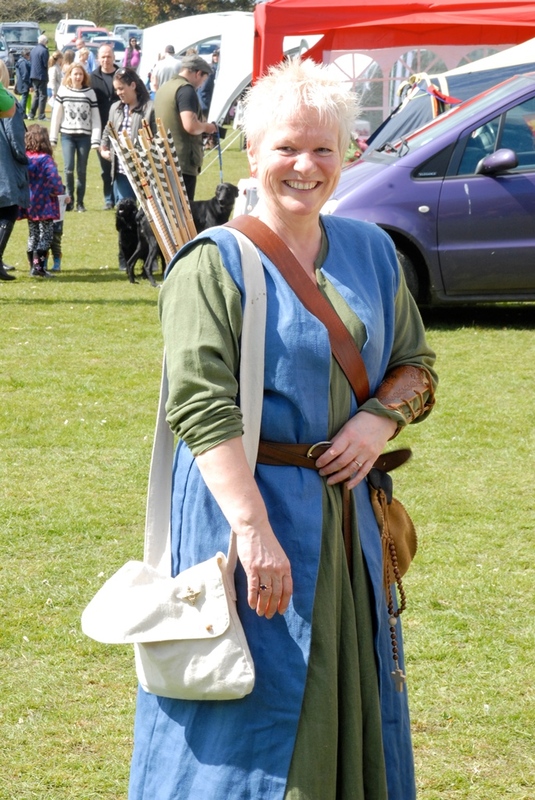 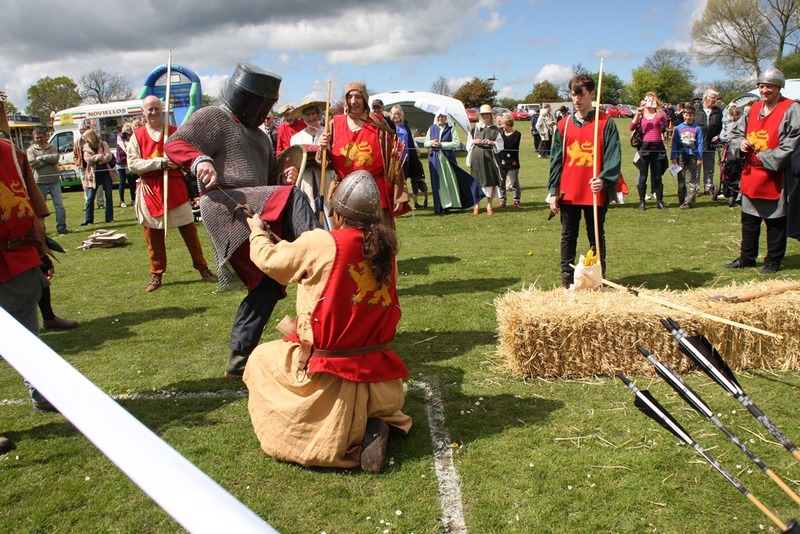 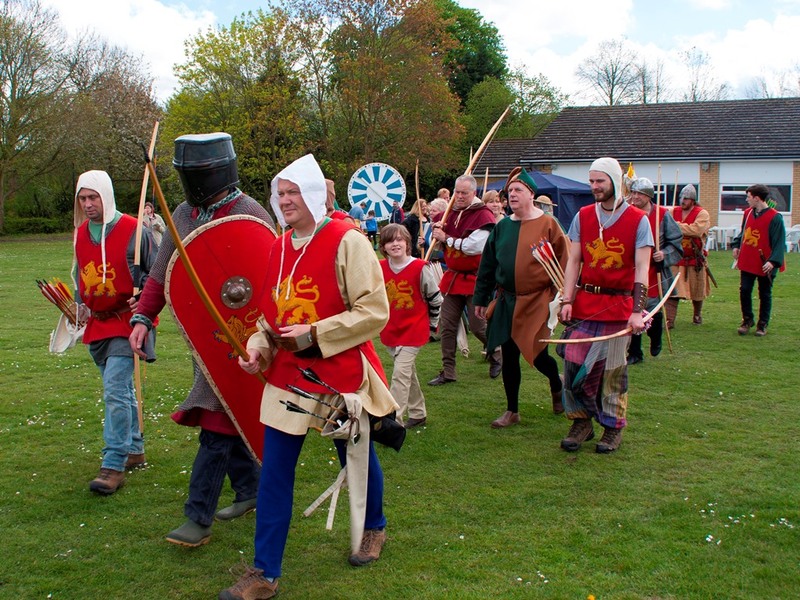 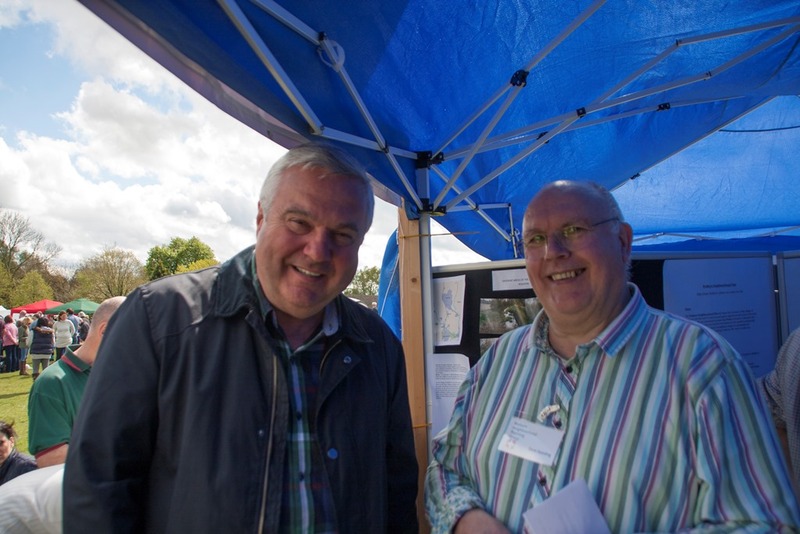 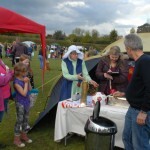 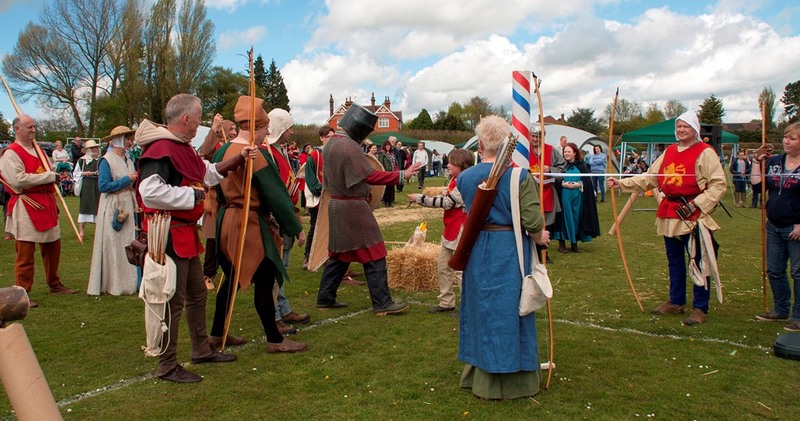 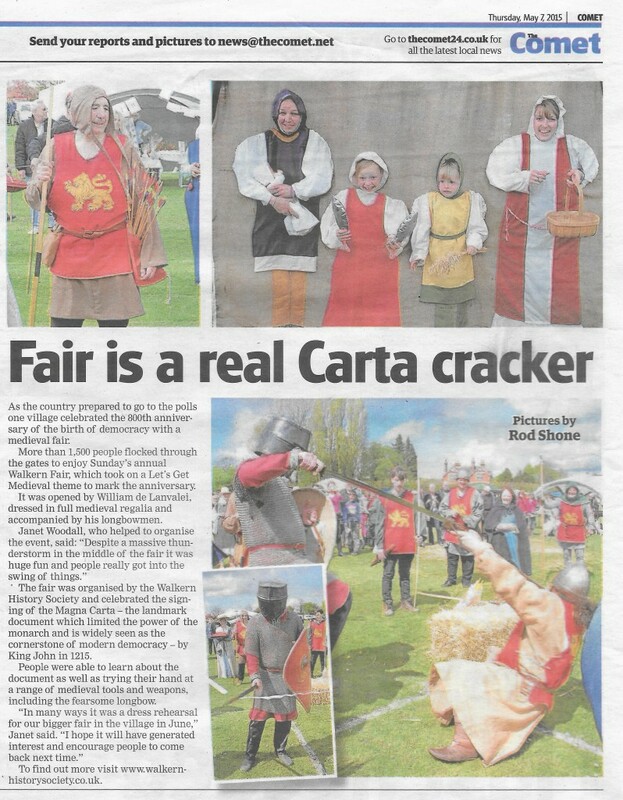 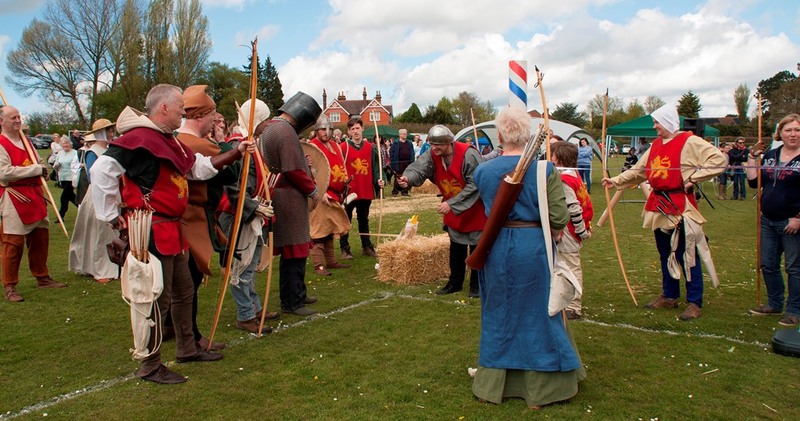 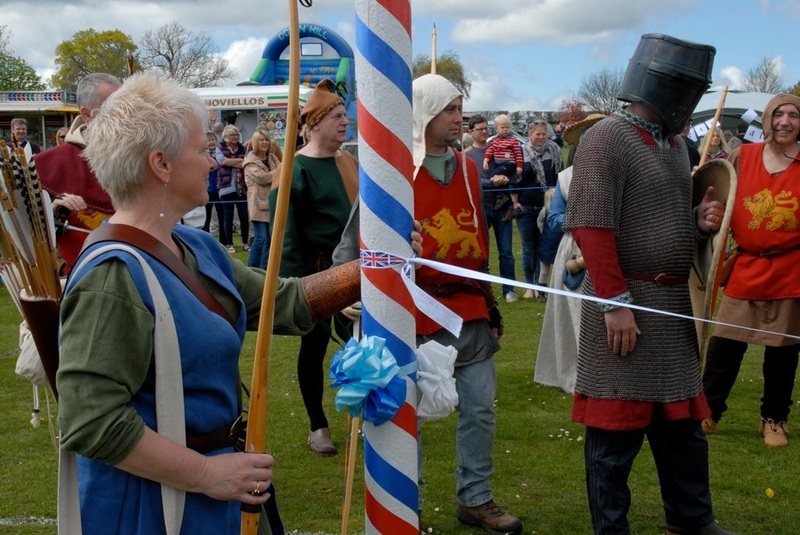 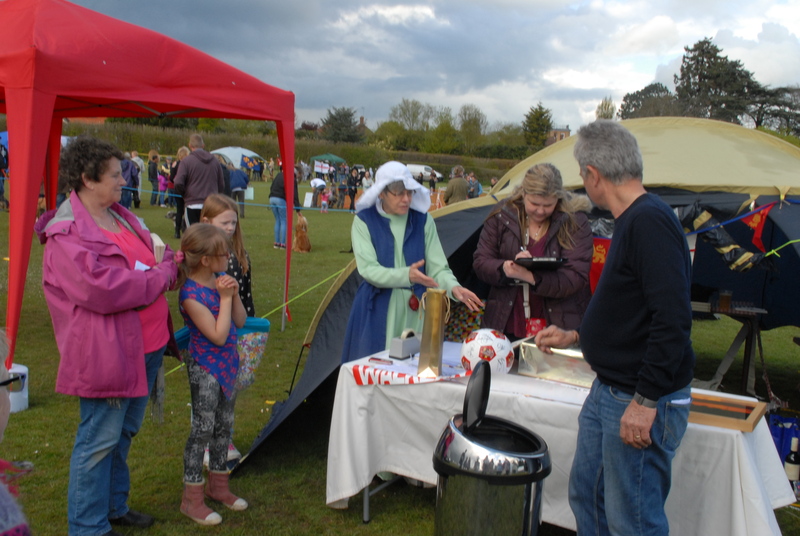 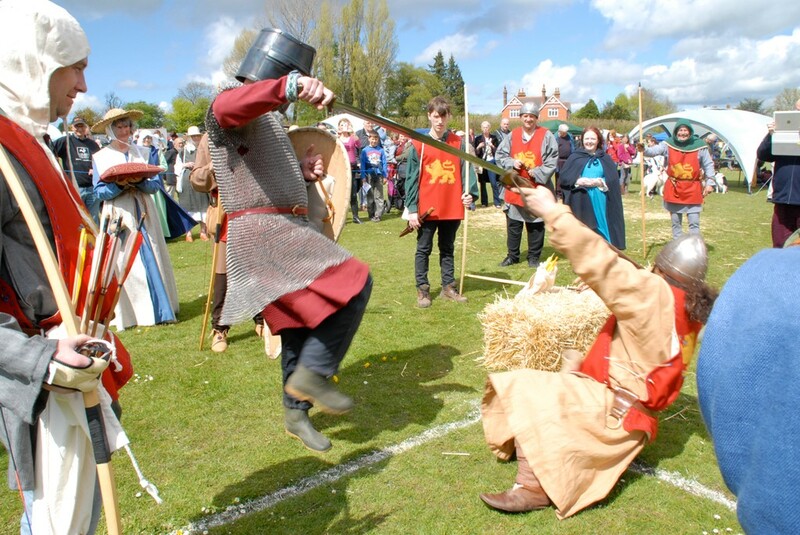 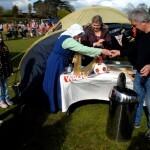 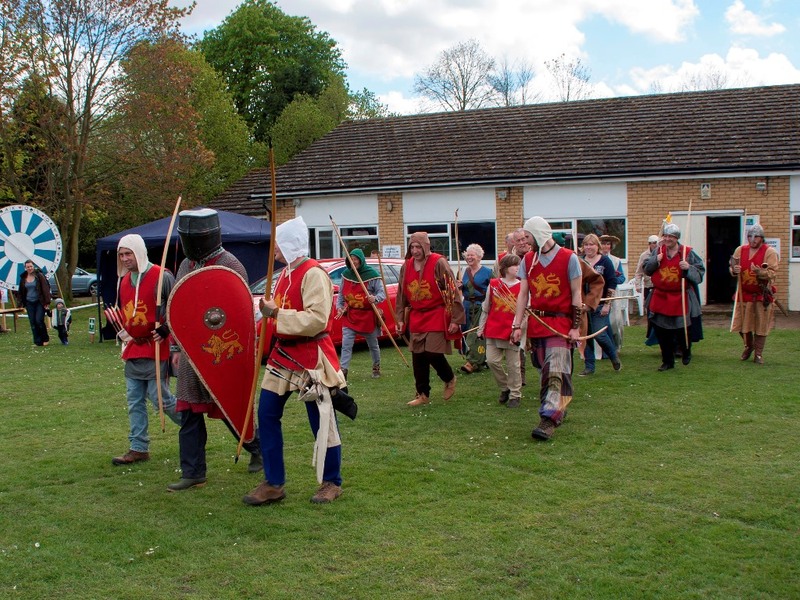 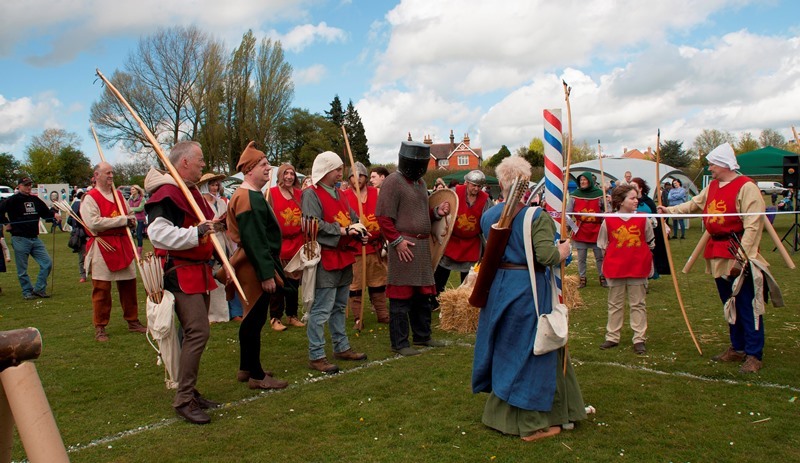 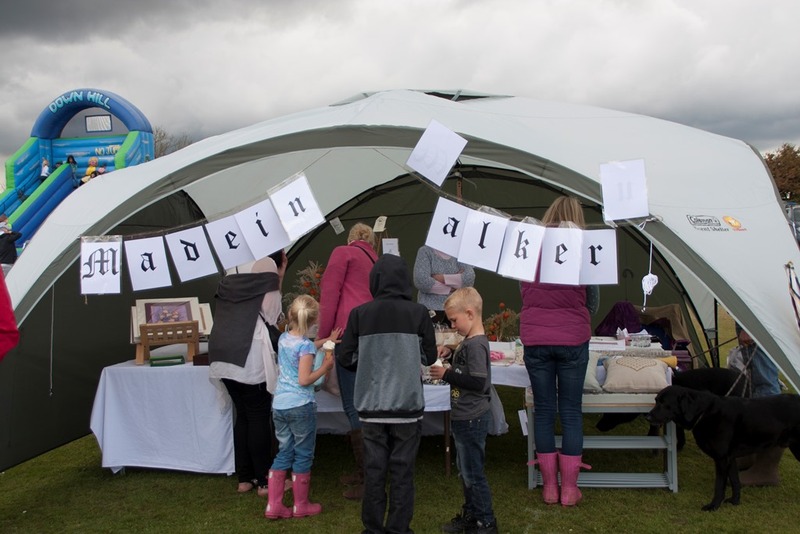 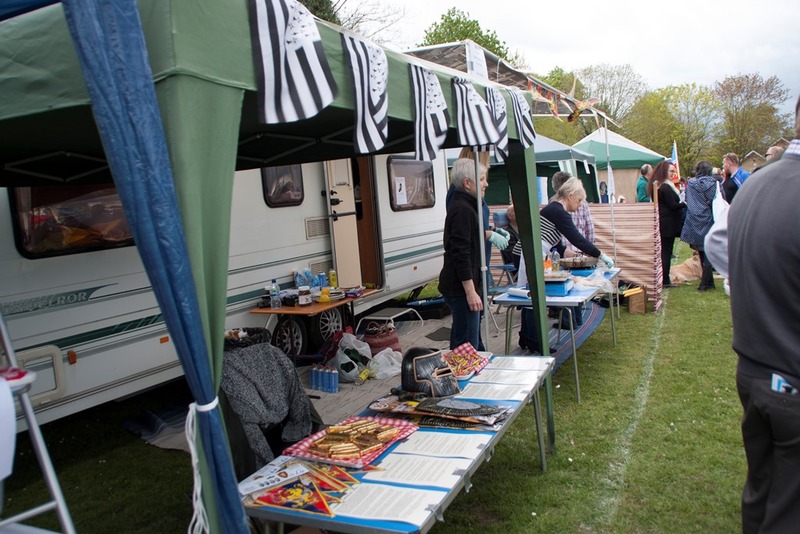 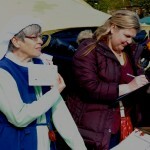 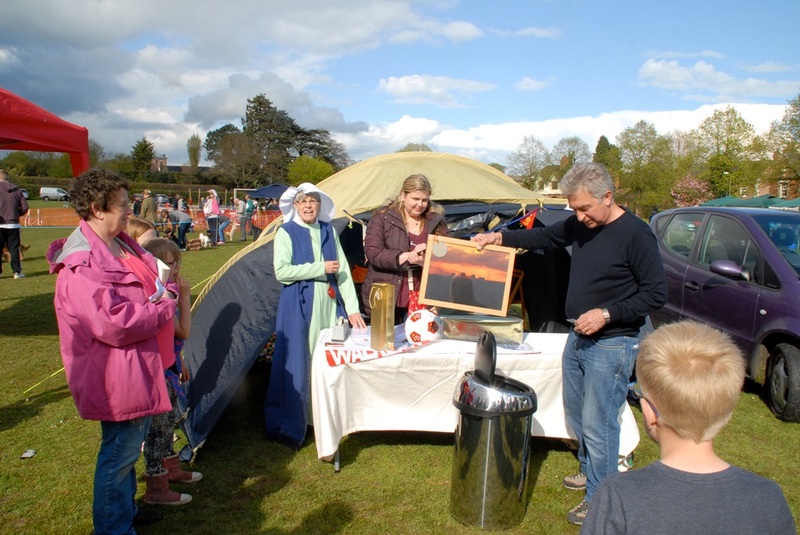 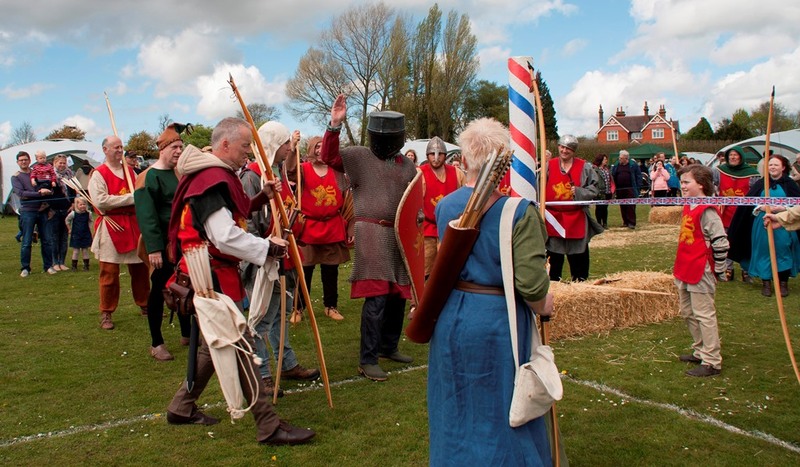 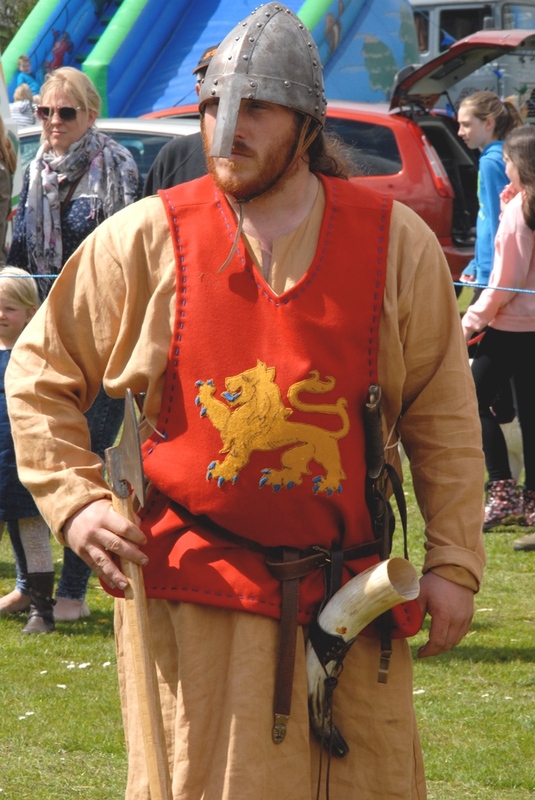 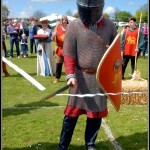 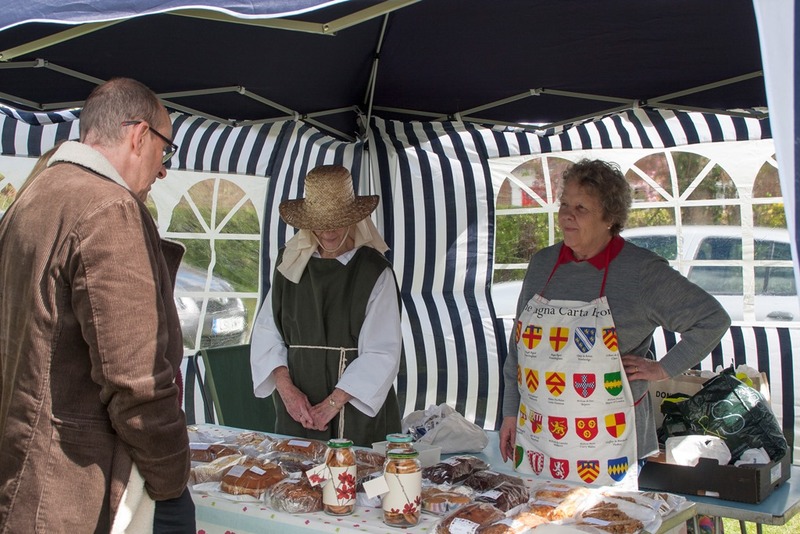 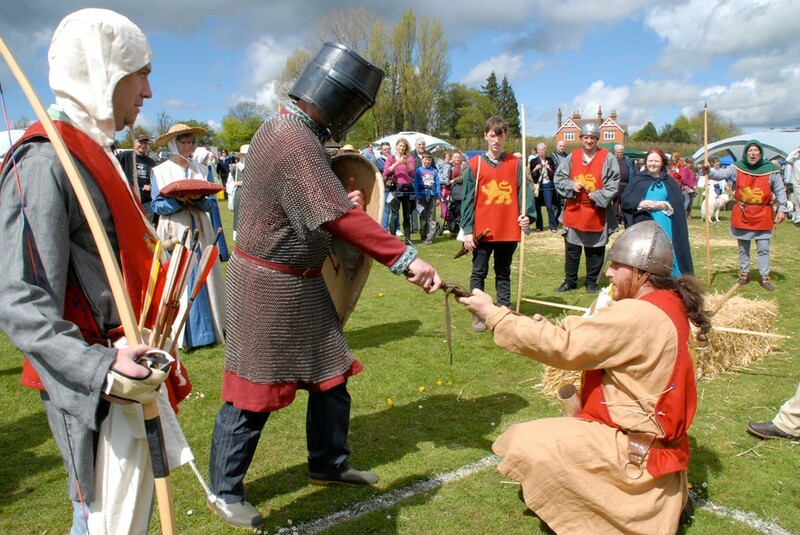 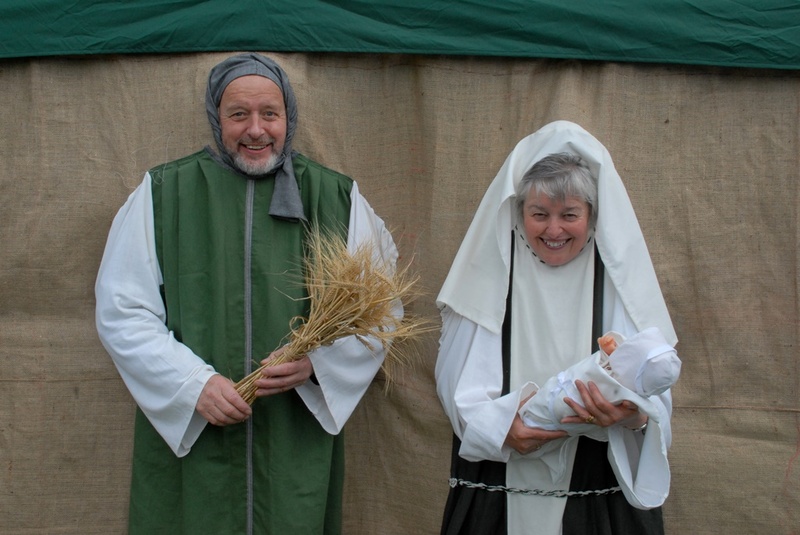 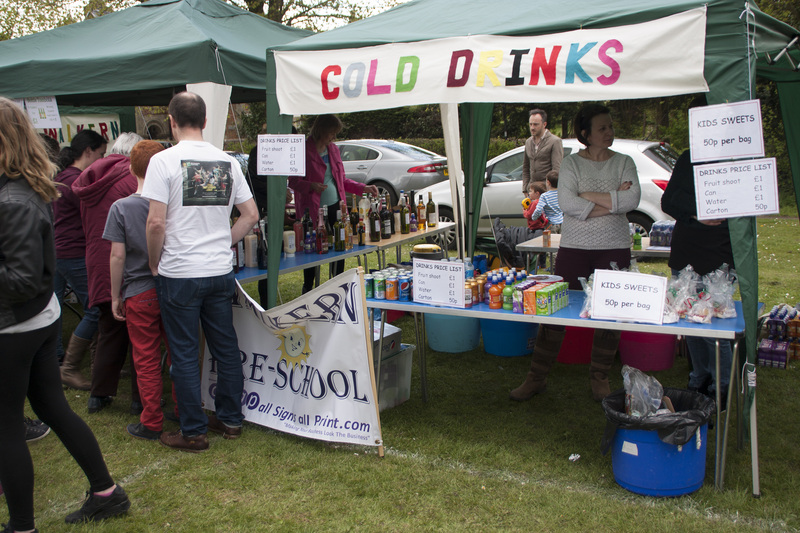 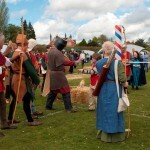 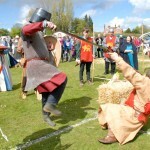 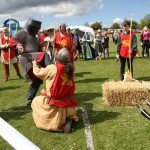 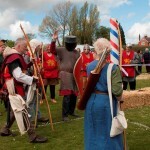 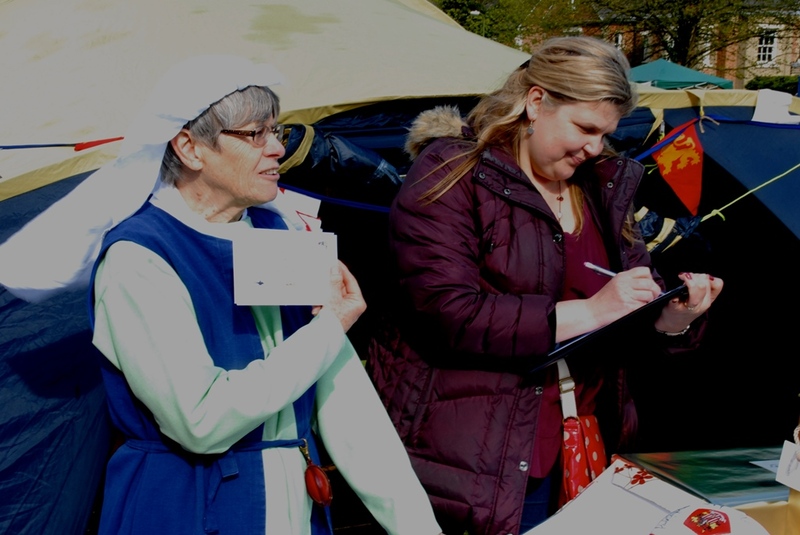 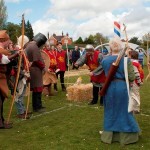 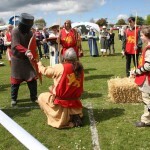 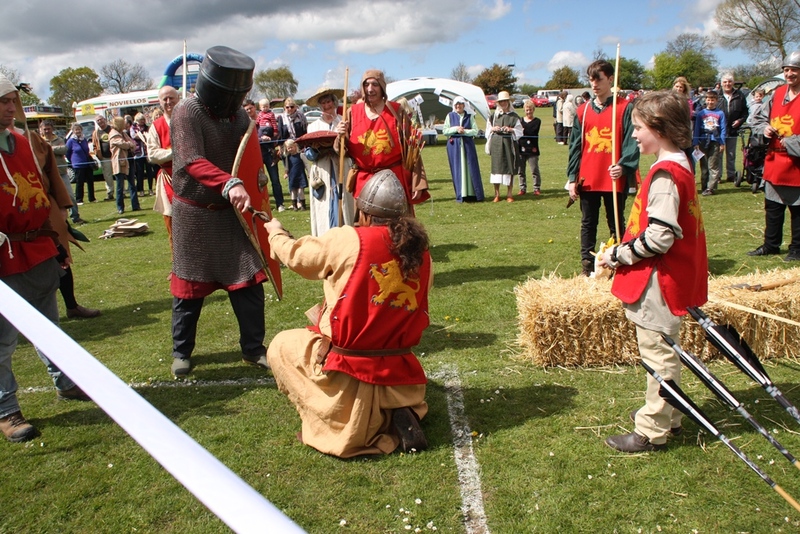 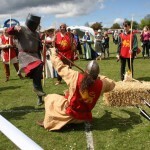 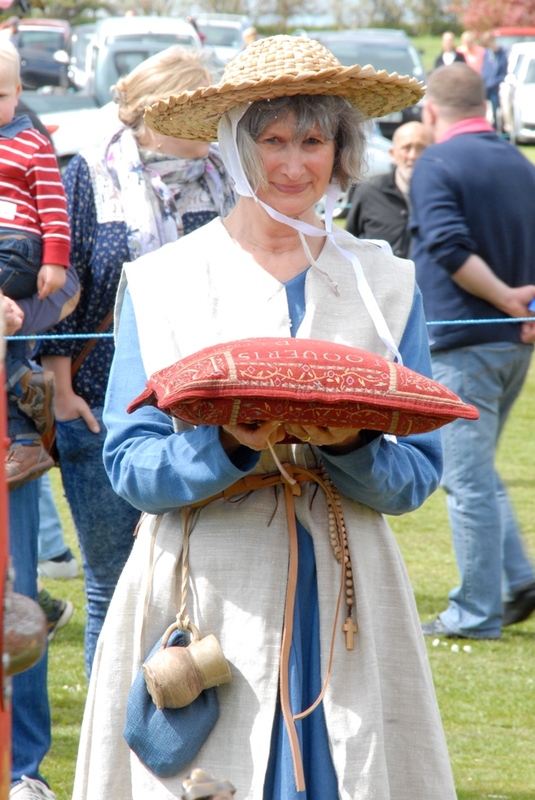 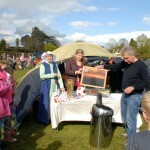 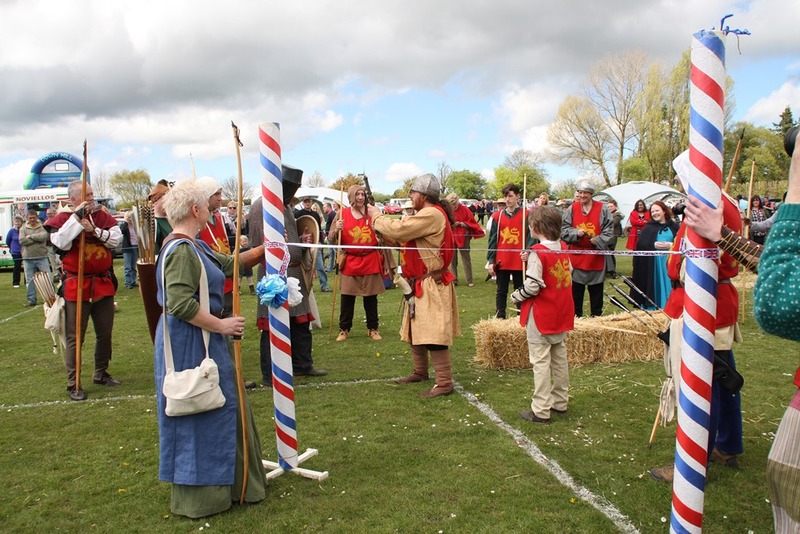 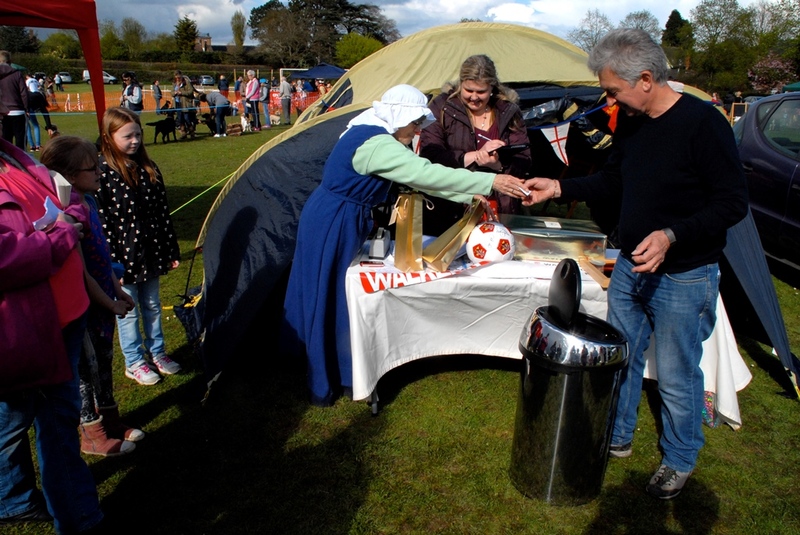 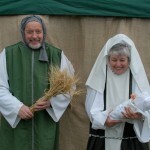 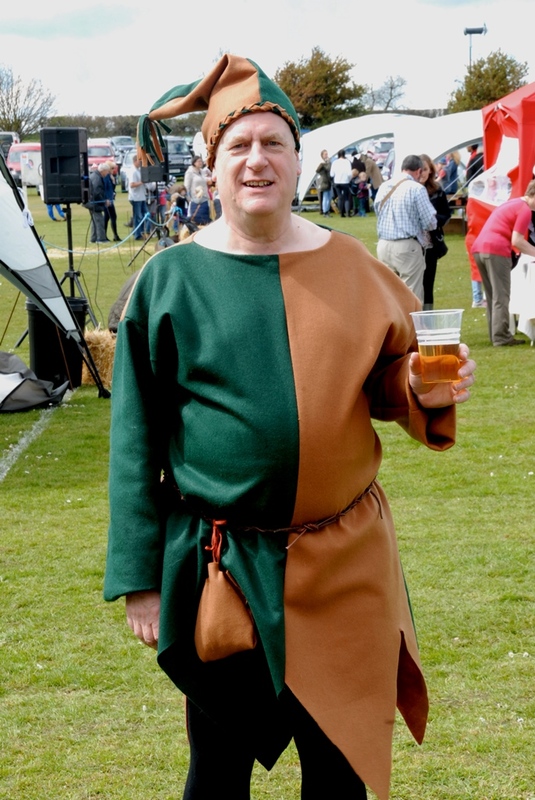 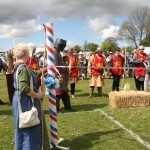 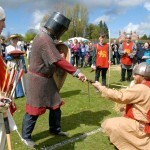 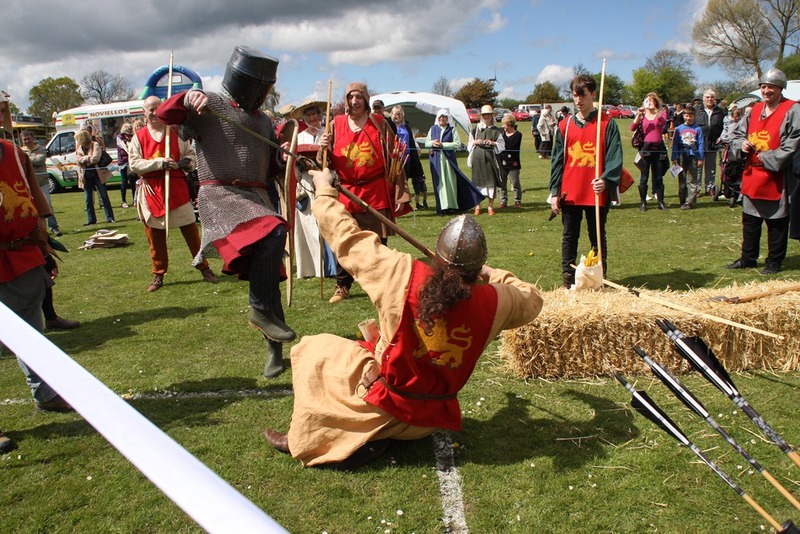 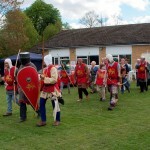 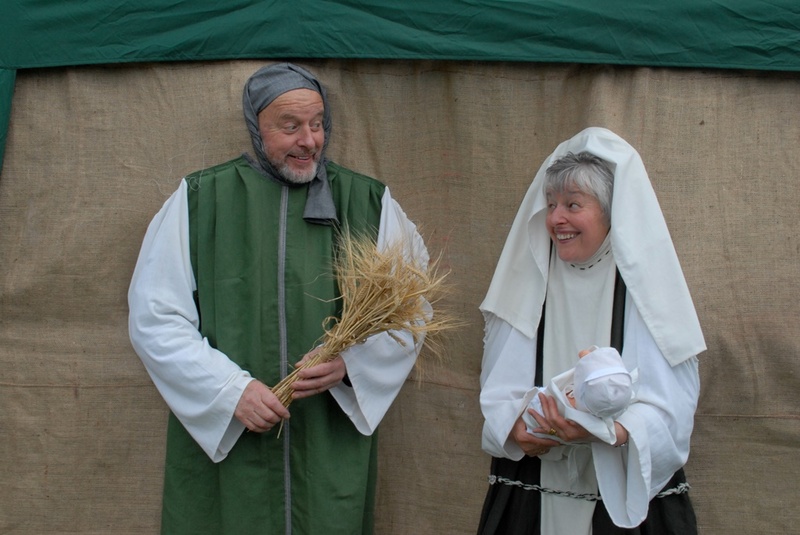 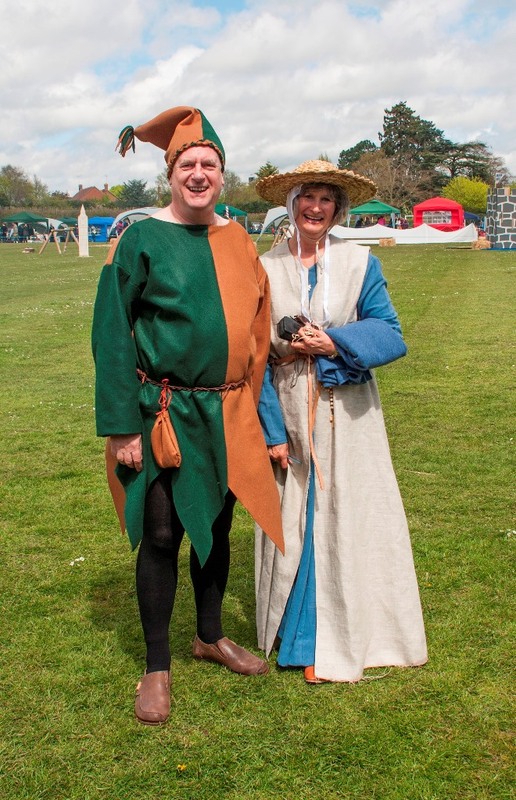 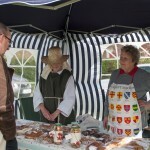 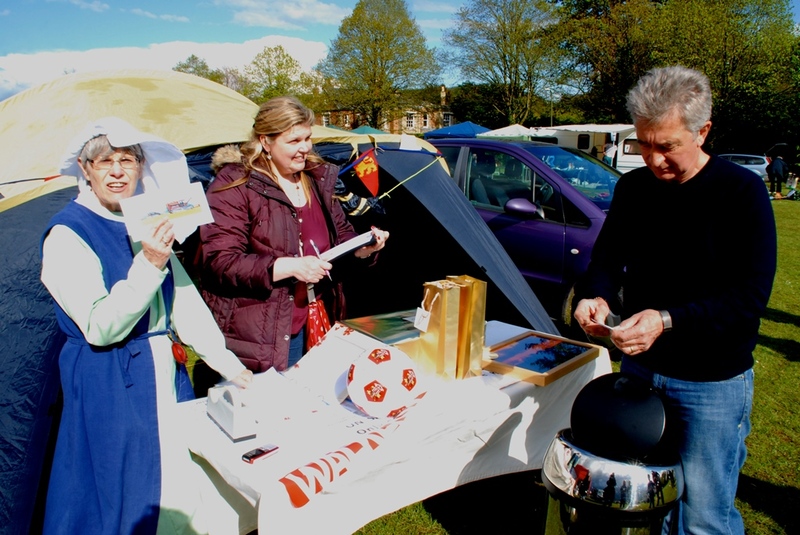 On Sunday 3rd May 2015, Walkern got Medieval at the village’s annual fair, raising money for local causes and awareness of our Magna Carta link. 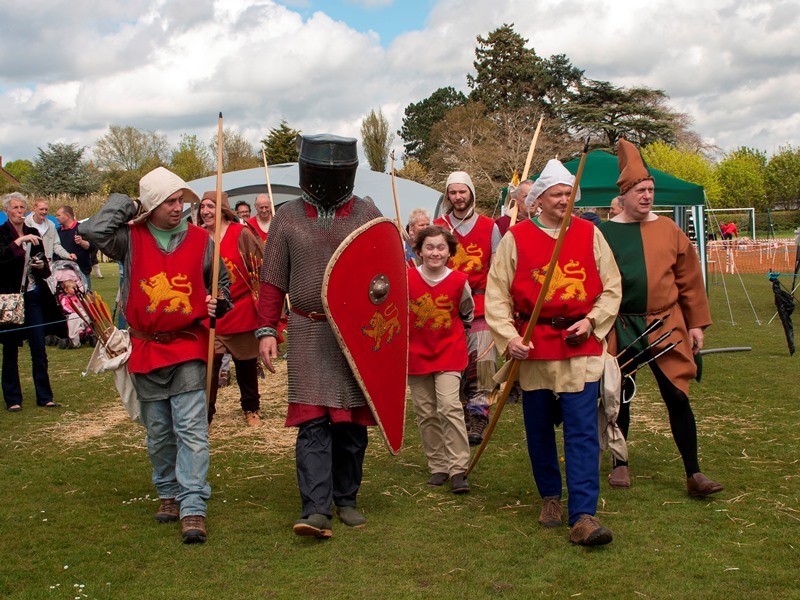 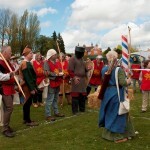 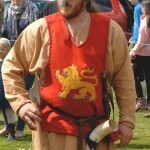 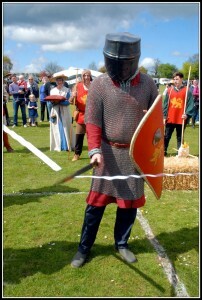 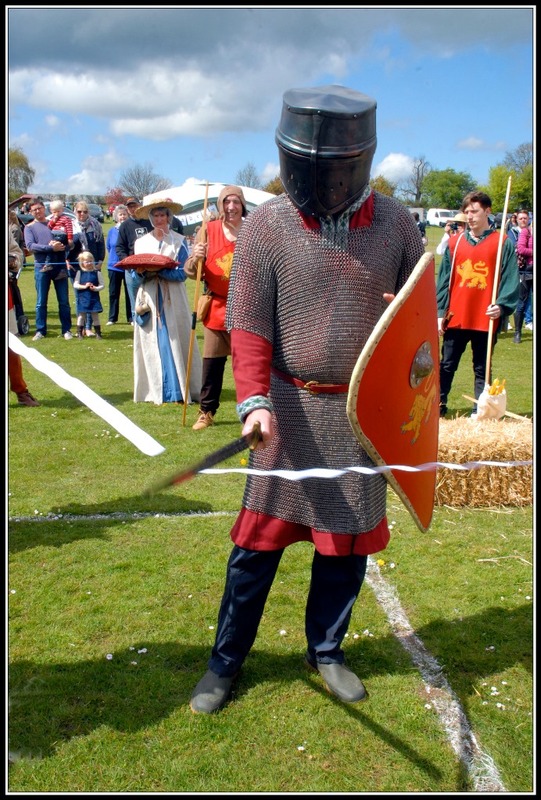 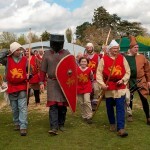 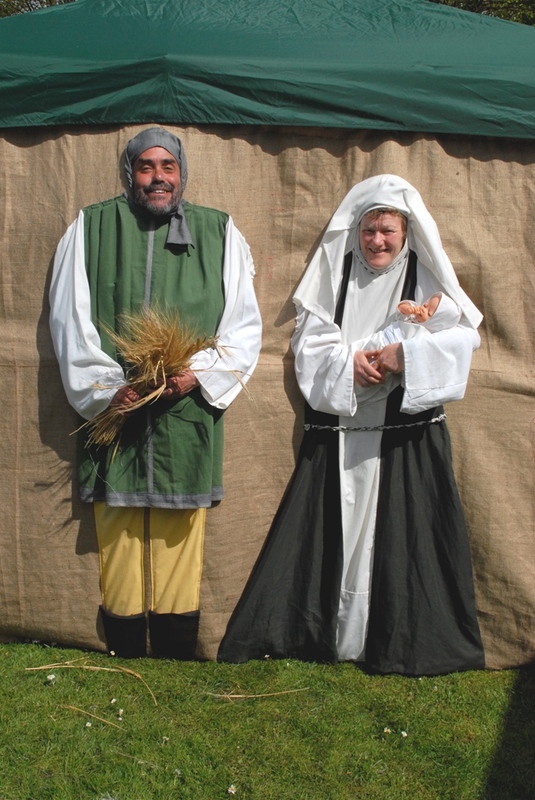 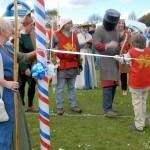 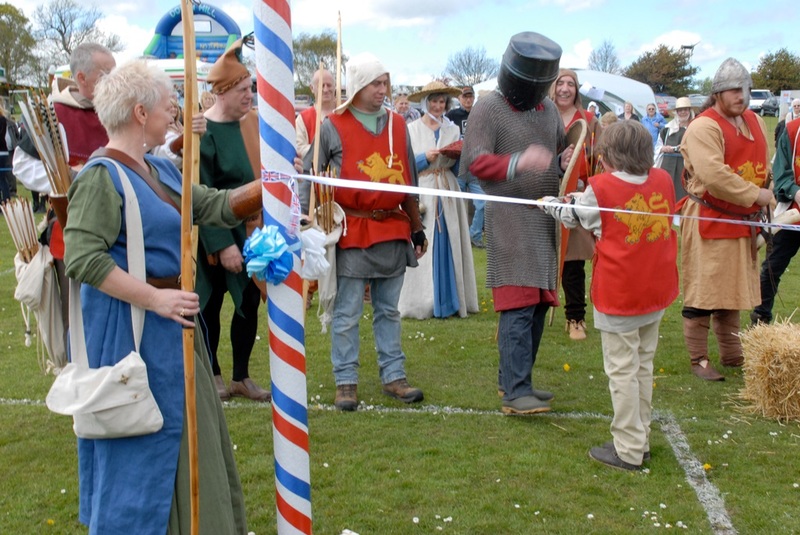 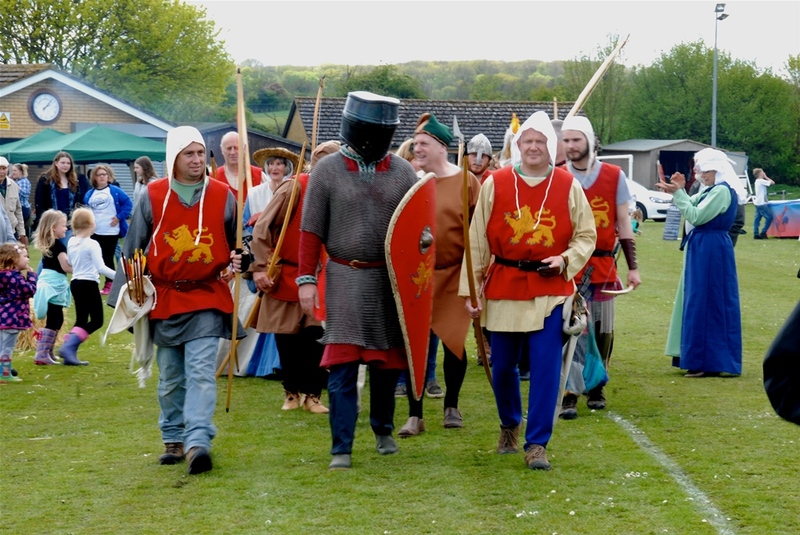 The fair opened at 2pm by our Magna Carta Baron, William de Lanvalei, wearing his Great Helm (commissioned within the village for Magna Carta celebrations) chainmail, and carrying a kite shield, just as his effigy does at St Mary’s church. 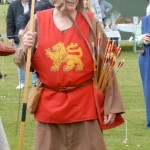 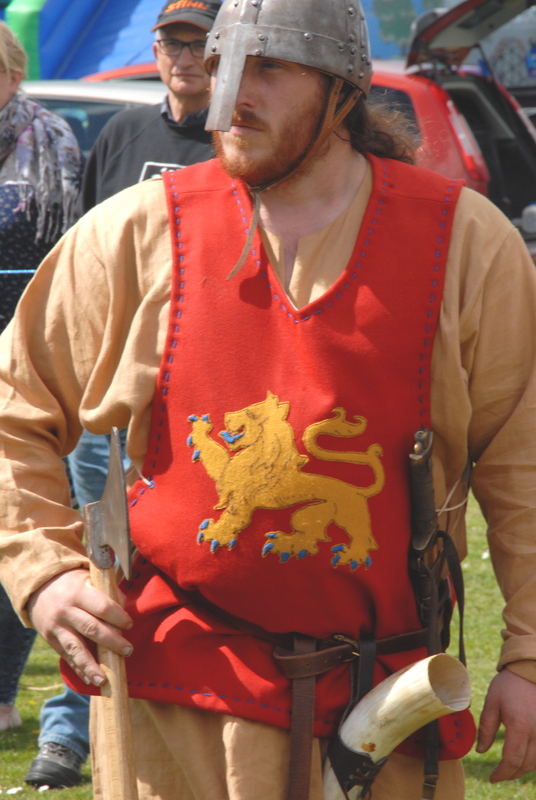 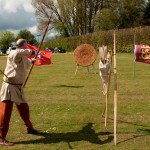 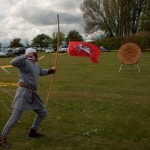 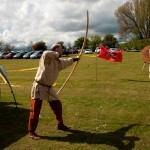 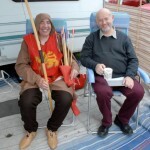 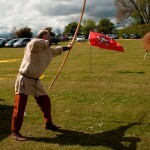 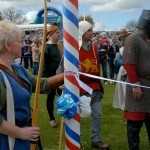 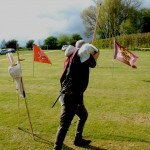 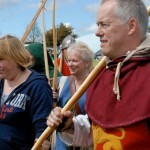 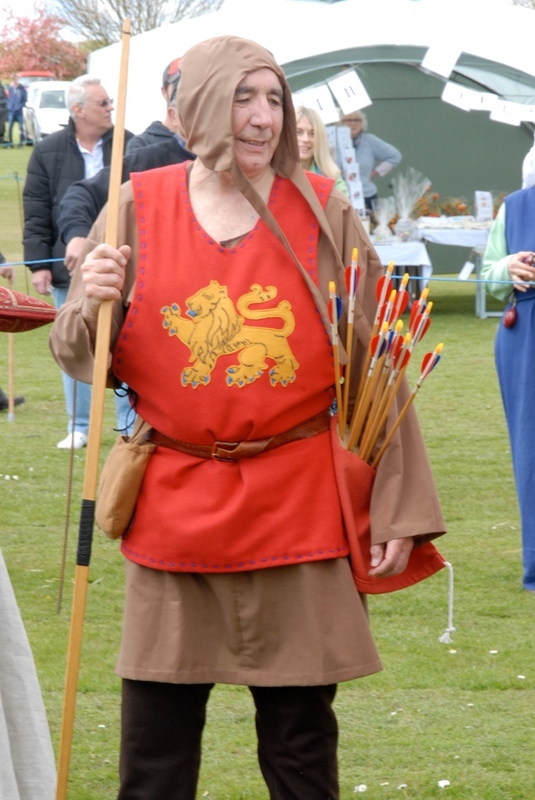 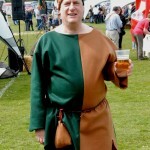 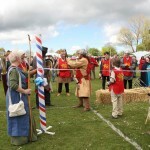 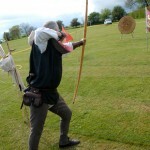 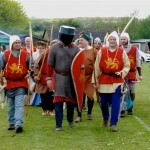 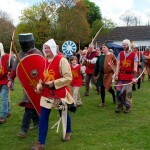 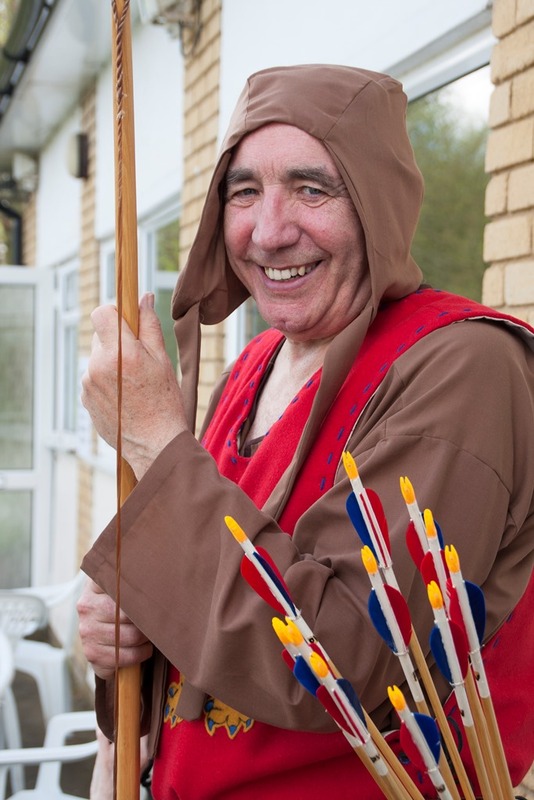 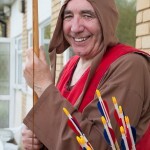 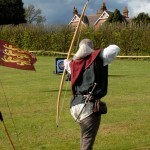 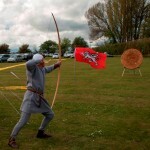 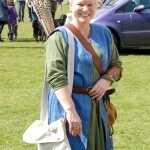 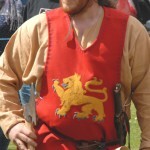 He was accompanied by his longbow archers, Company de Lanvalei, in their livery coats made by Walkern’s Medieval sewing bee. 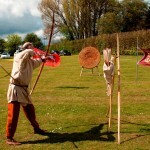 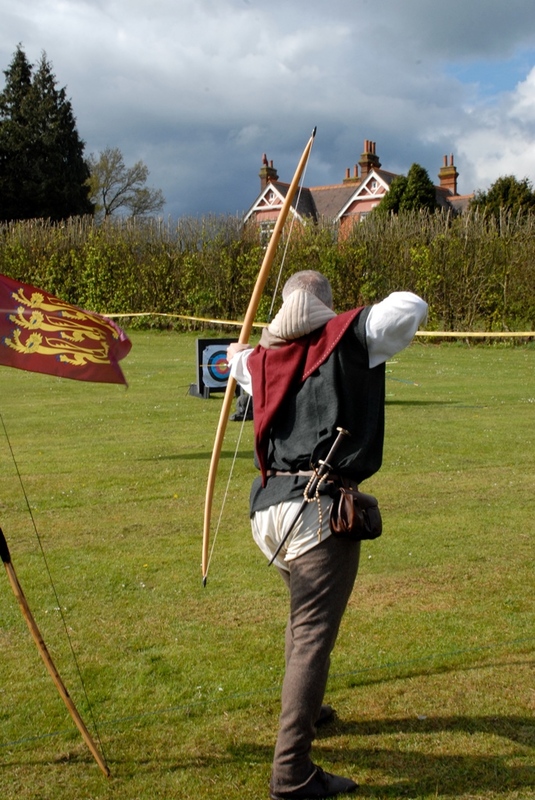 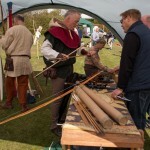 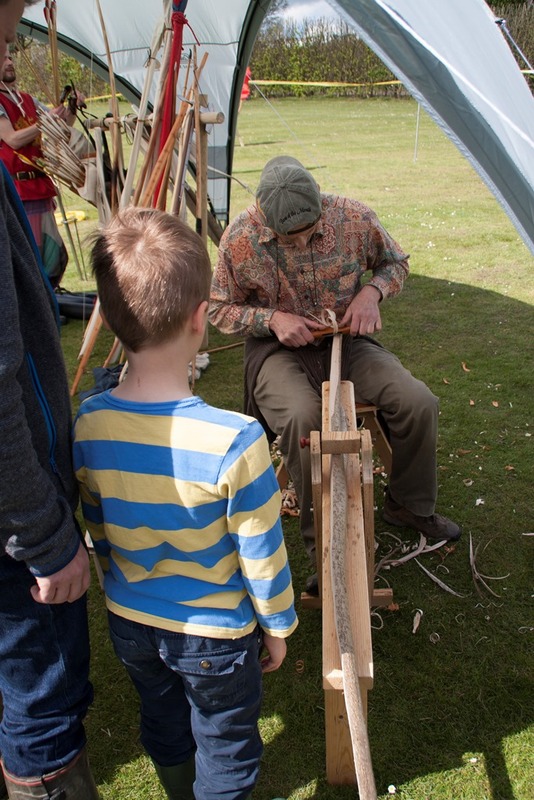 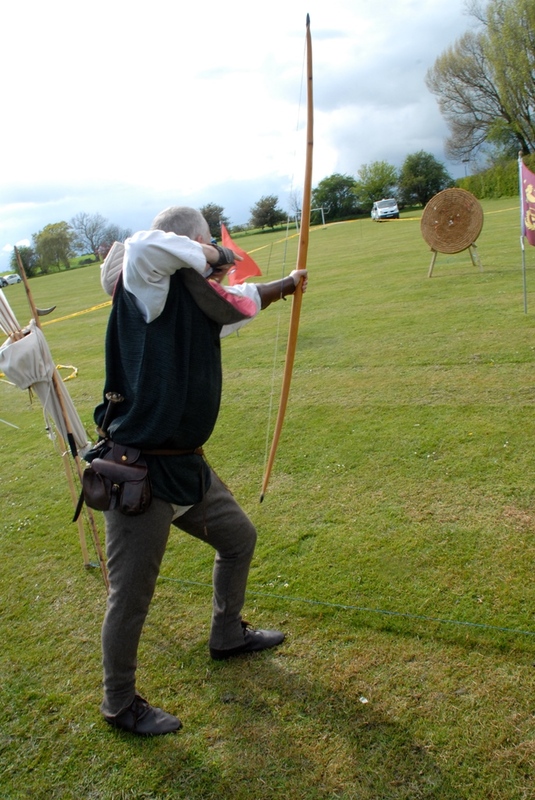 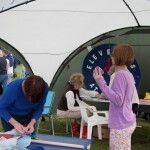 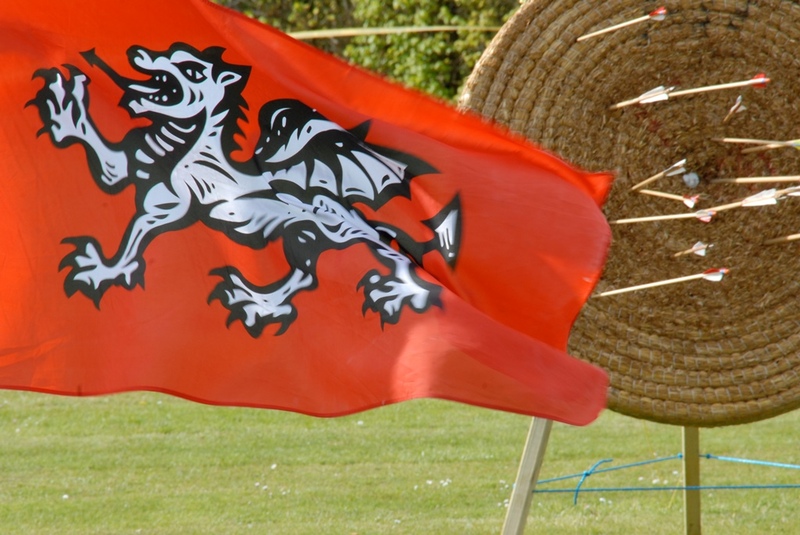 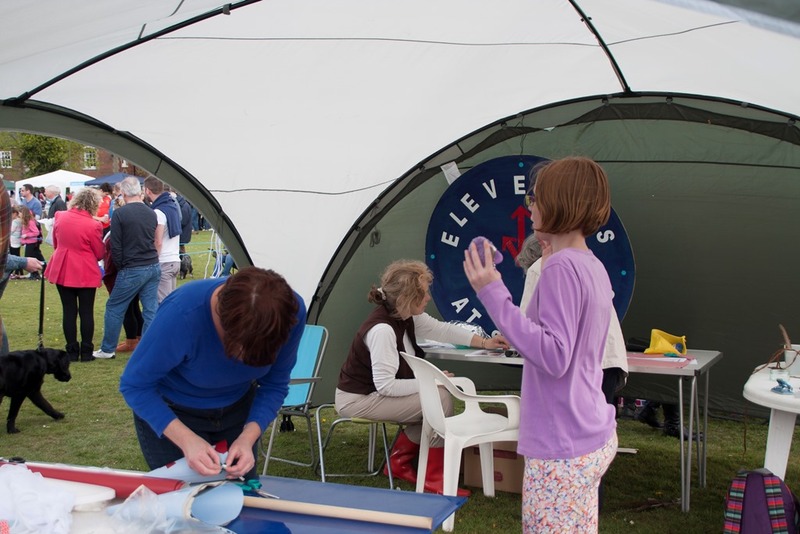 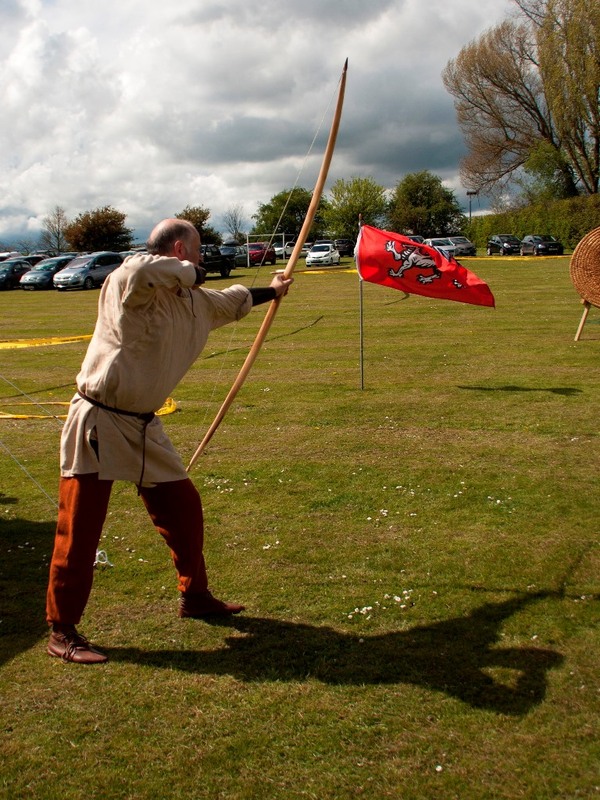 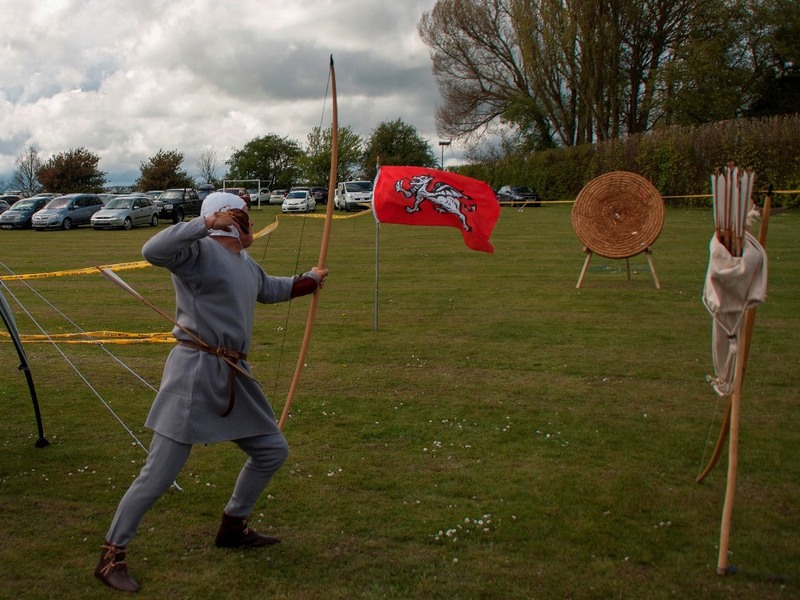 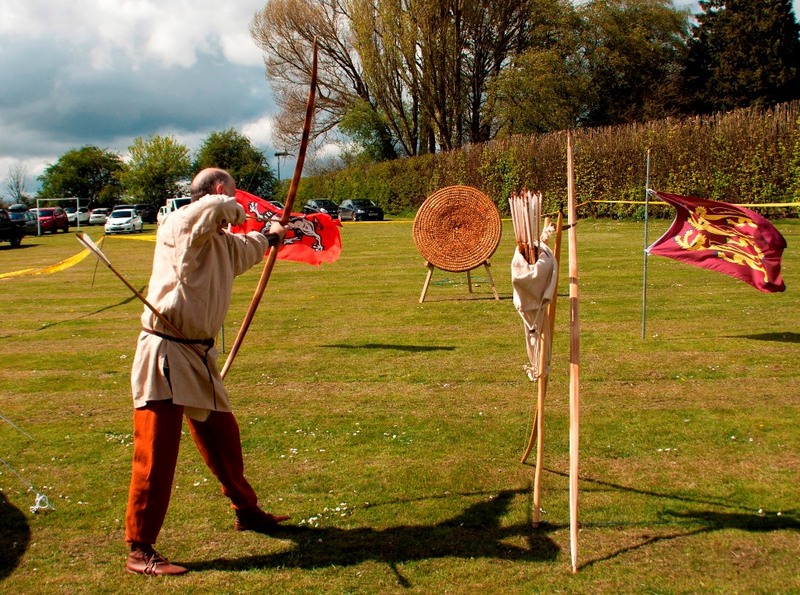 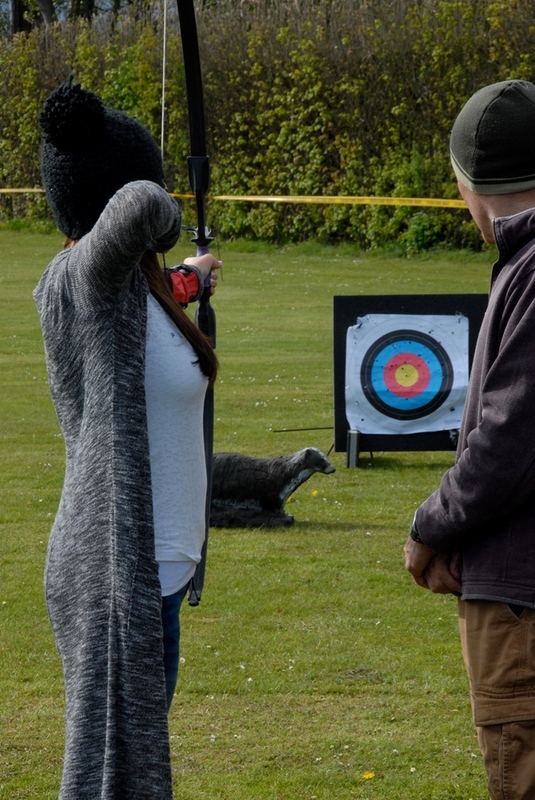 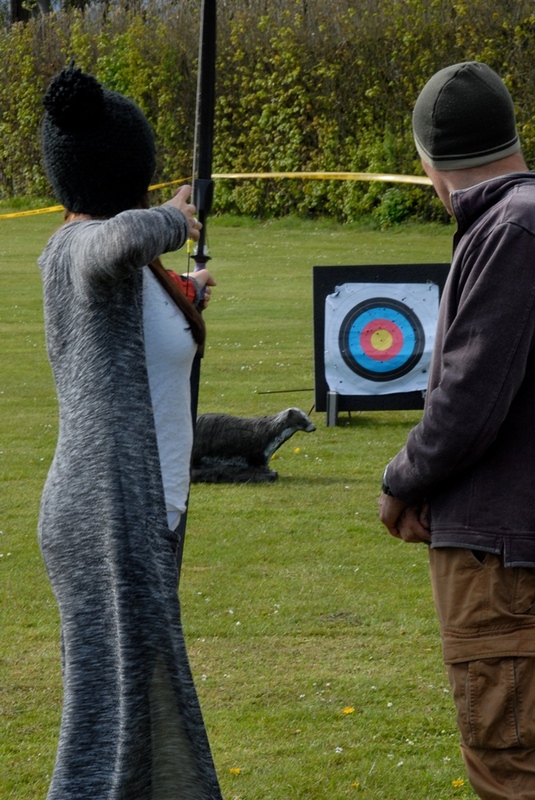 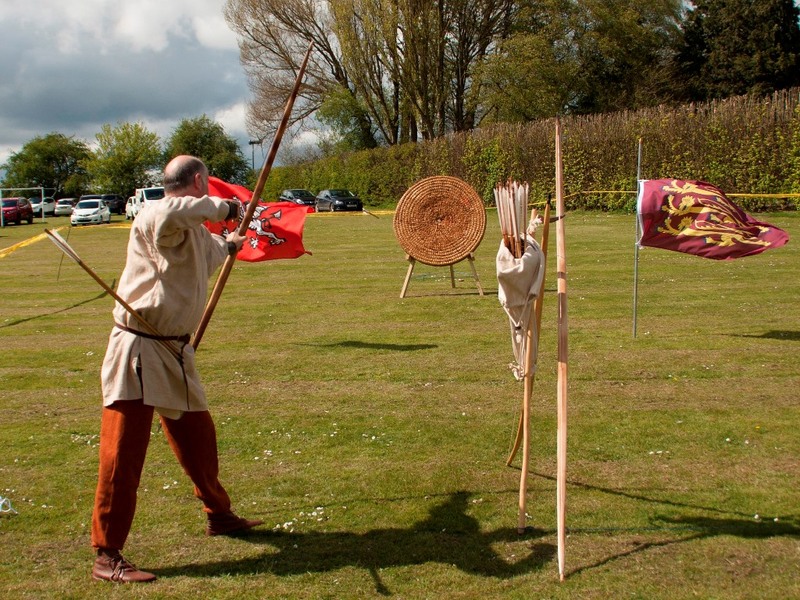 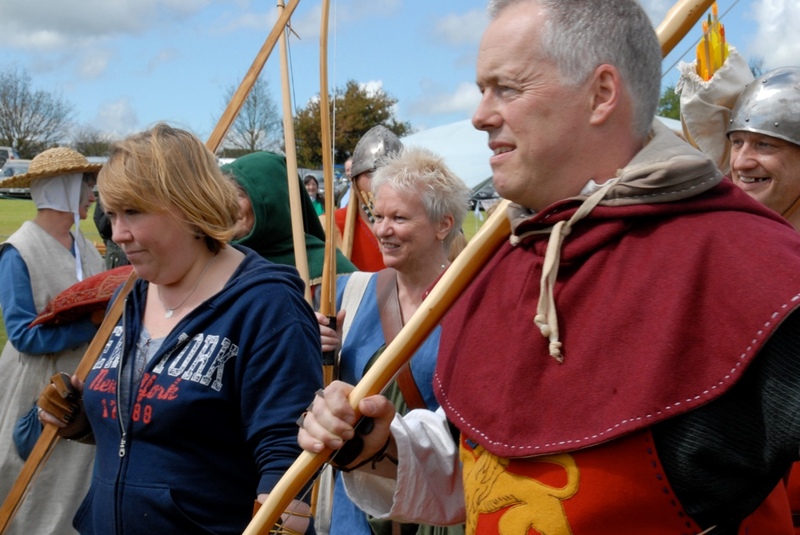 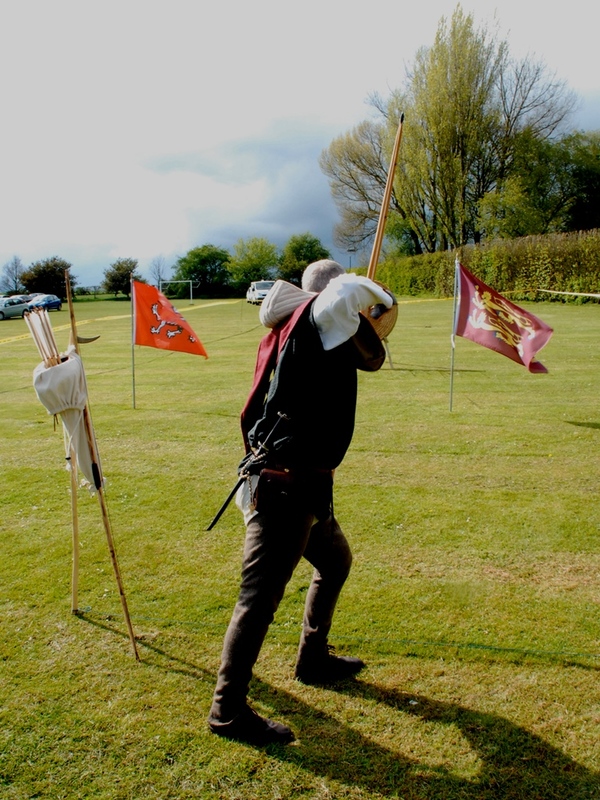 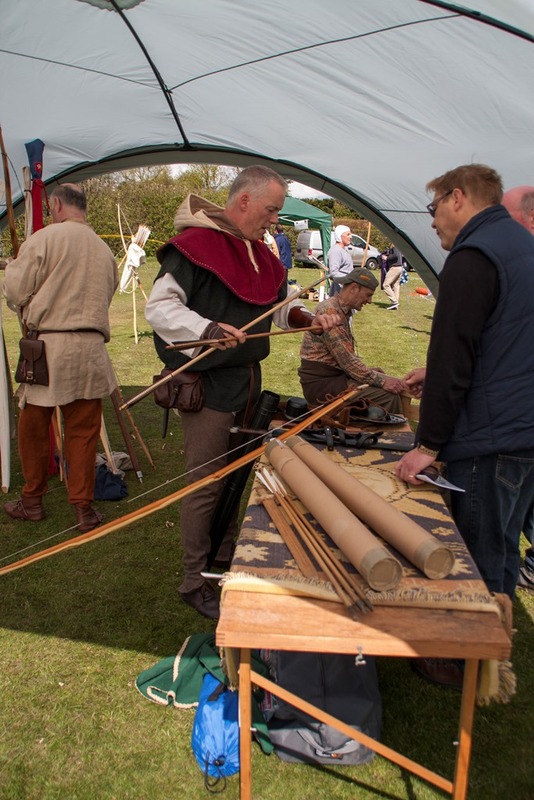 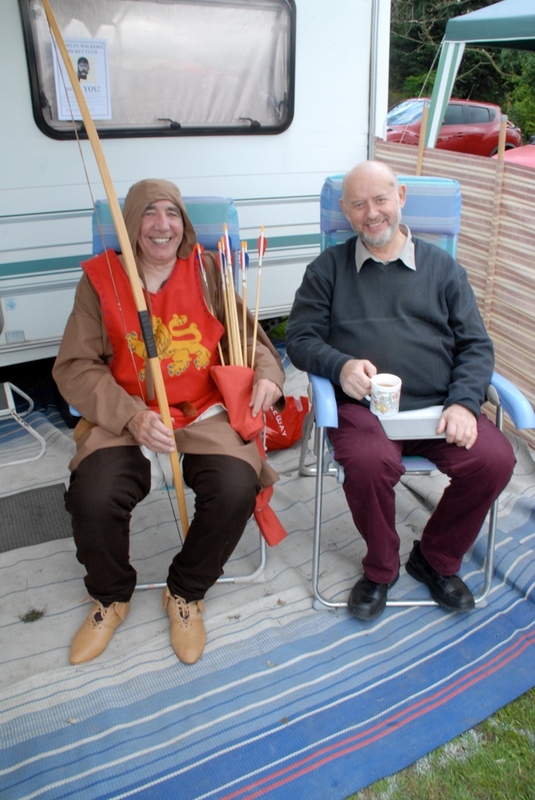 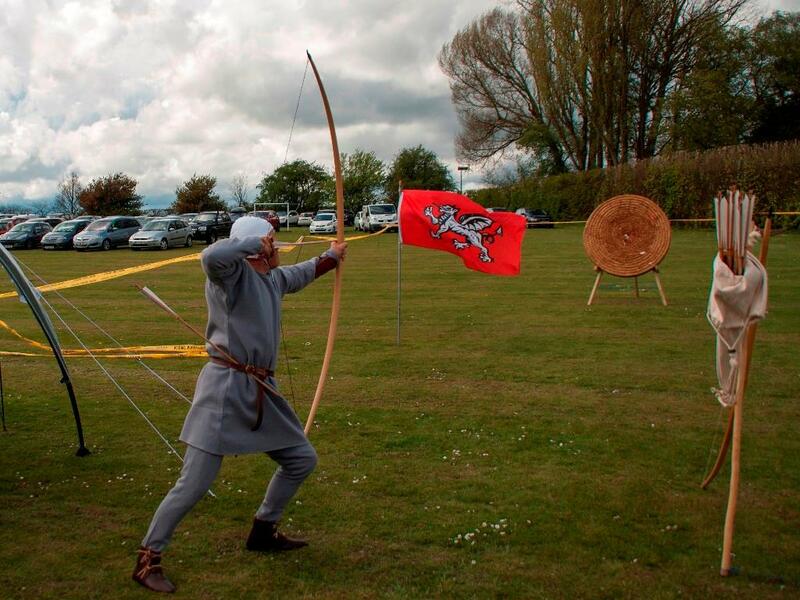 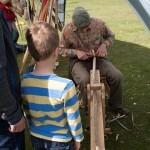 Despite an impressive thunderstorm during the afternoon, there was plenty of time for visitors to try their hands at our have-a-go archery stall, and for those who thought they were as strong as a medieval archer, they could attempt to draw a medieval longbow. 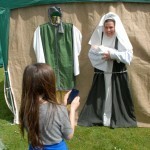 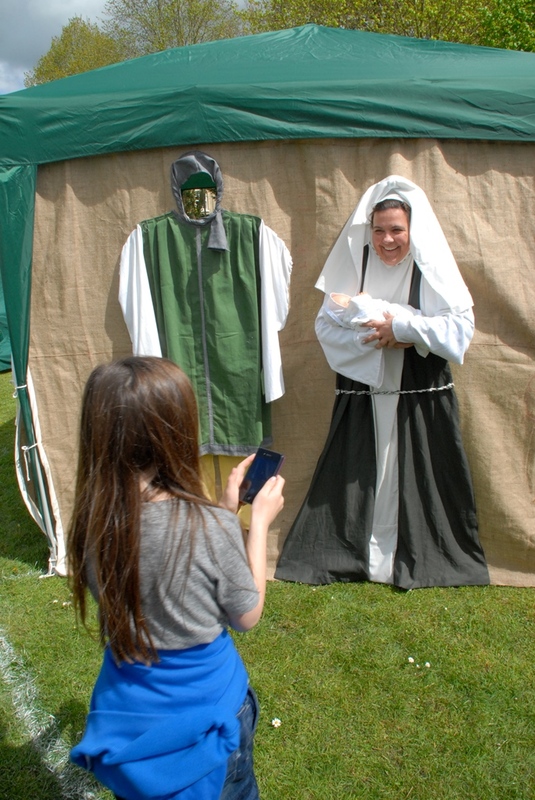 Our ‘Medieval selfie stall’ was a great hit. 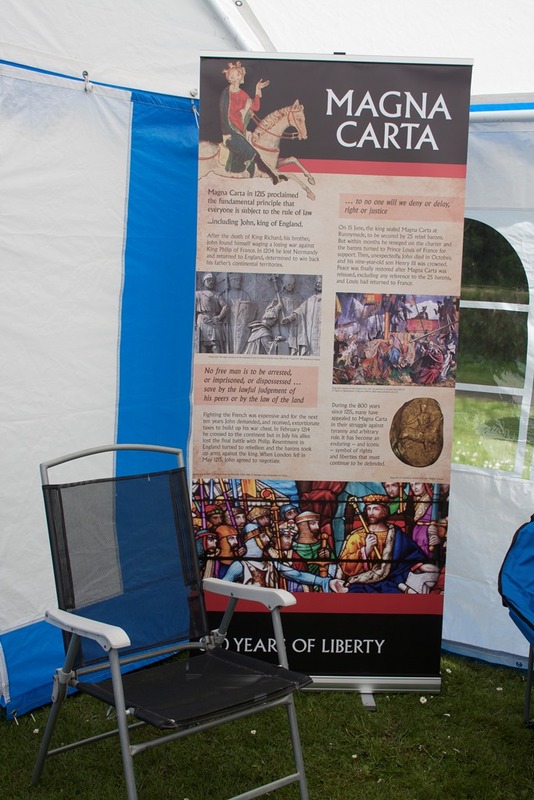 The Walkern History Society stand included a display about de Lanvalei, the rebel barons and Magna Carta. 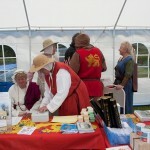 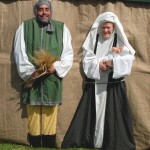 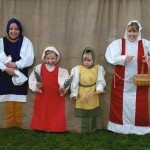 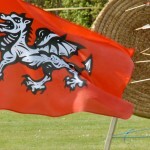 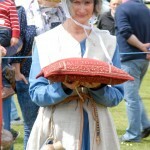 The products and souvenirs of our Medieval past that we had for sale ? 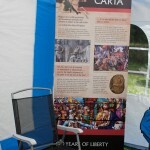 mugs, teatowels, cards, posters, flags, books ? 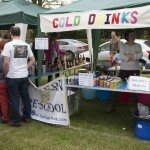 are also available through this website. 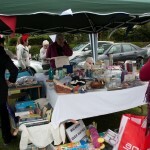 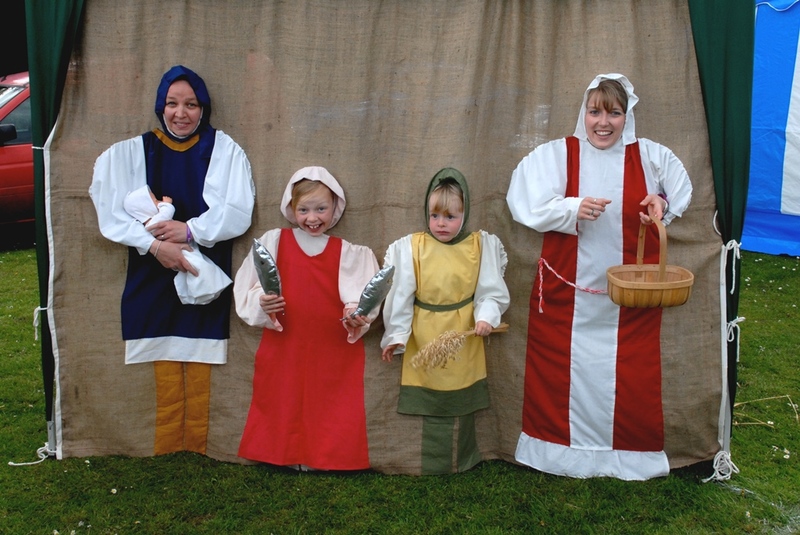 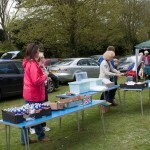 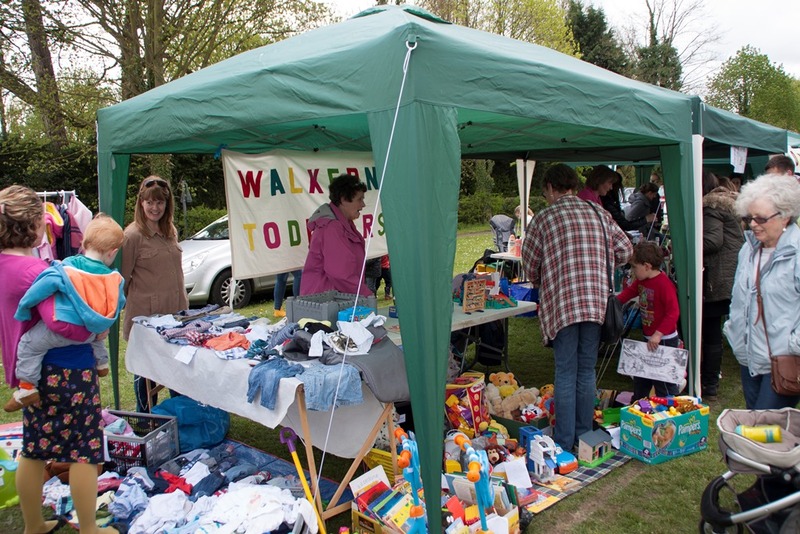 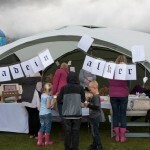 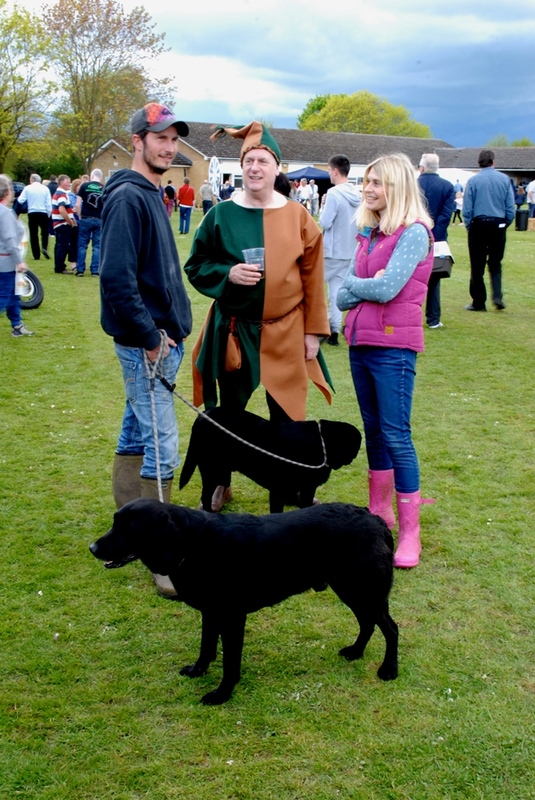 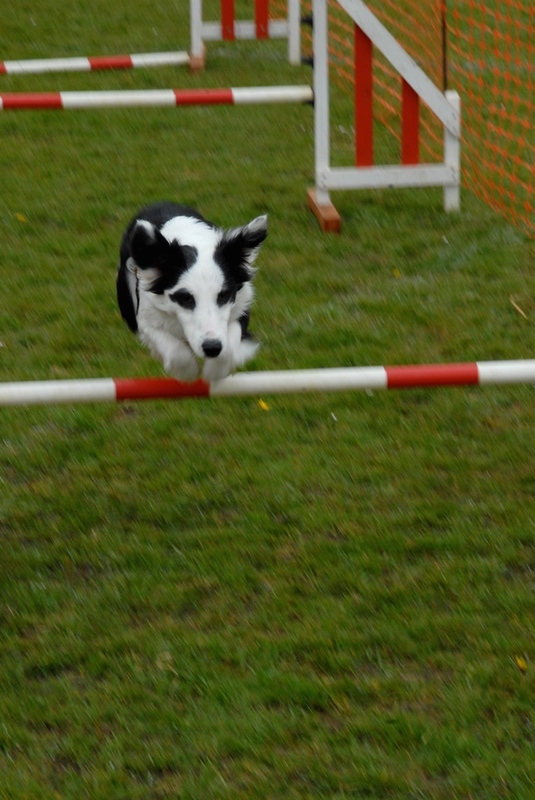 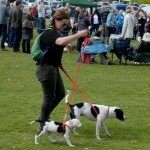 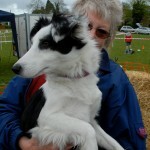 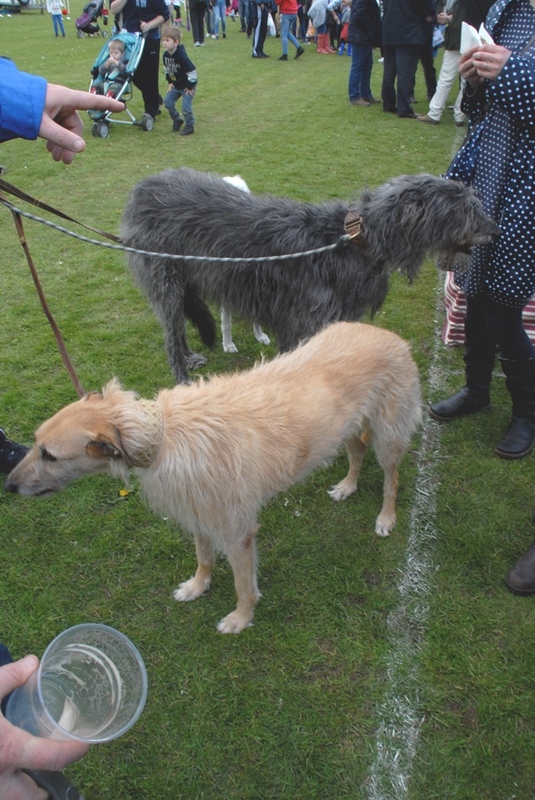 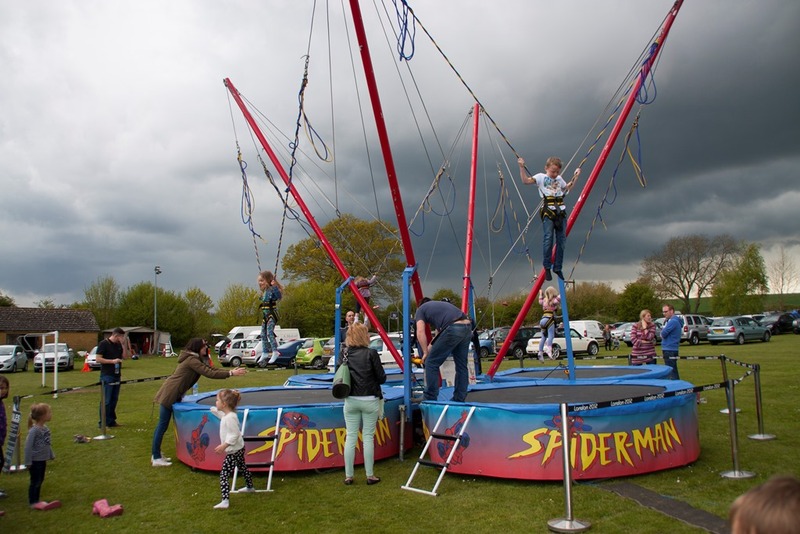 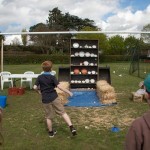 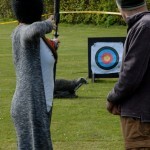 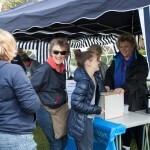 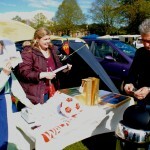 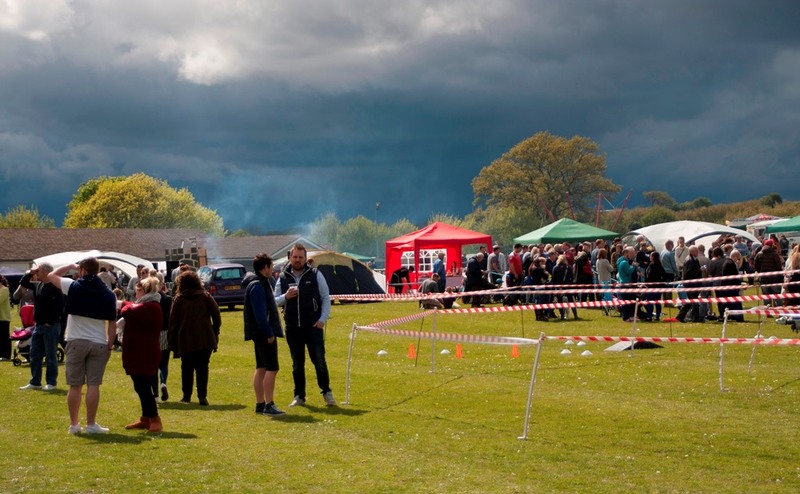 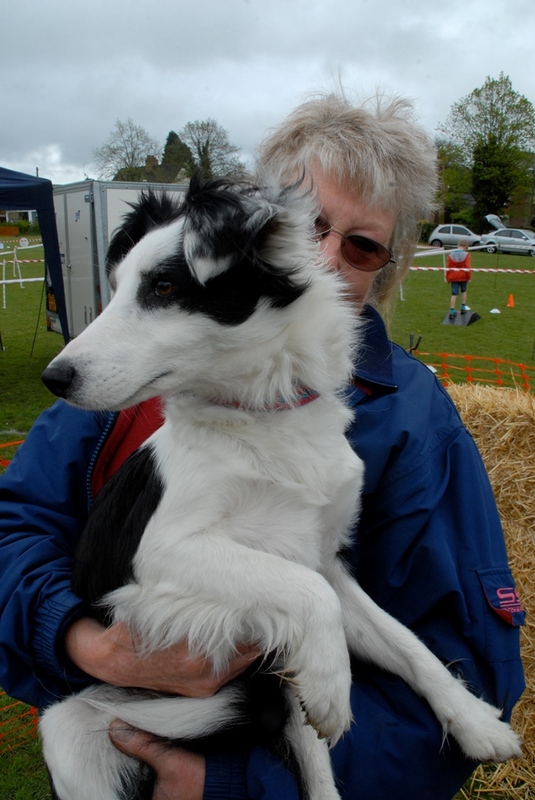 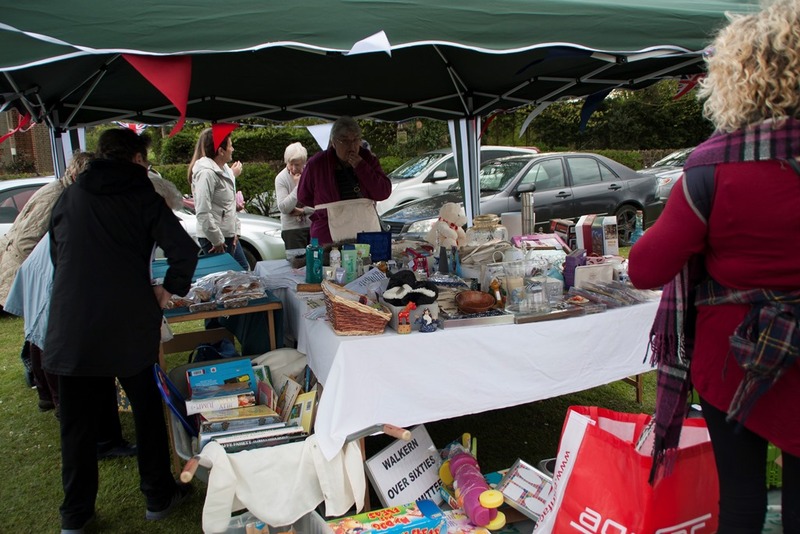 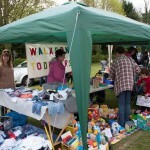 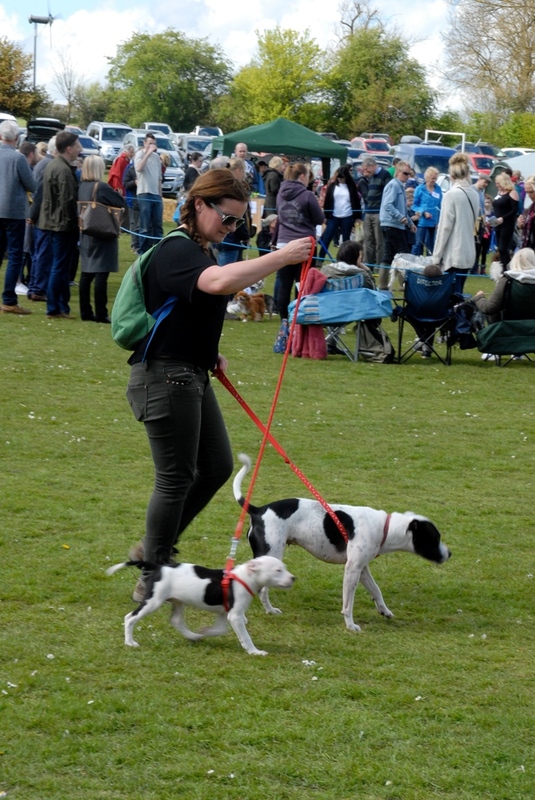 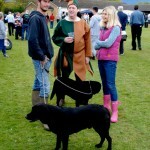 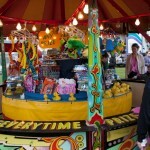 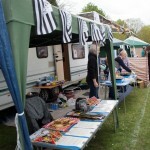 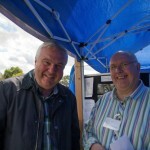 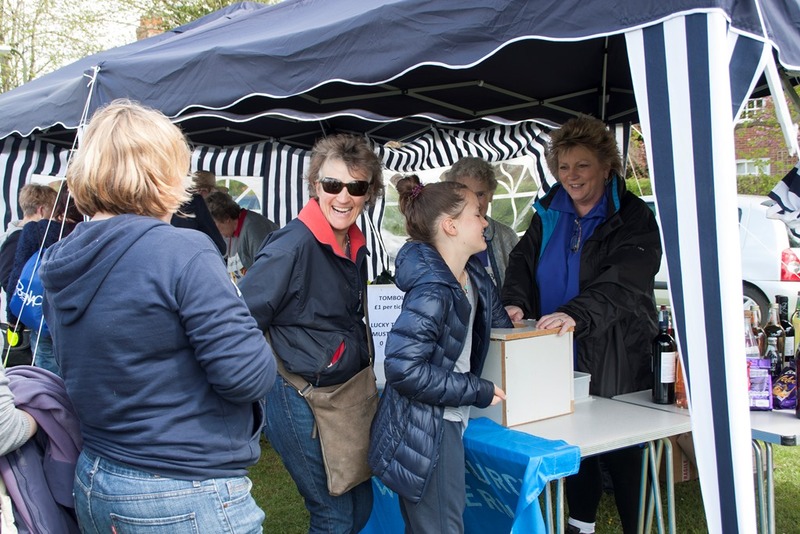 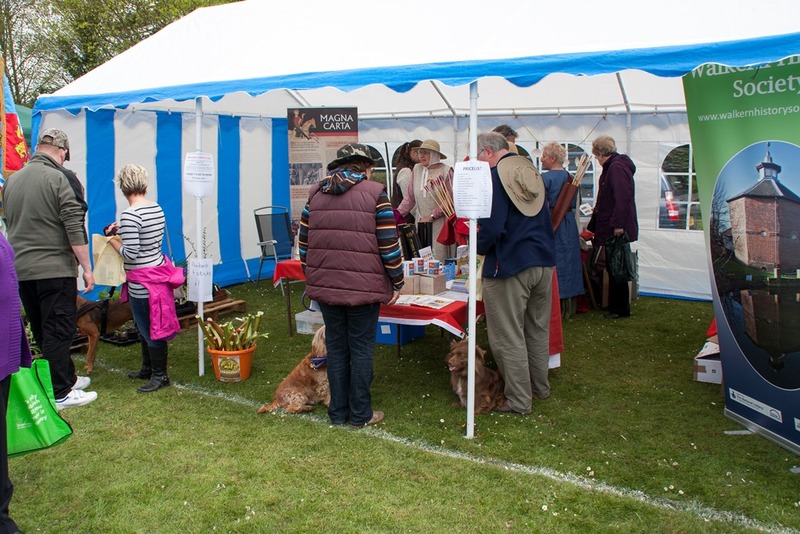 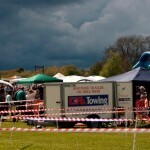 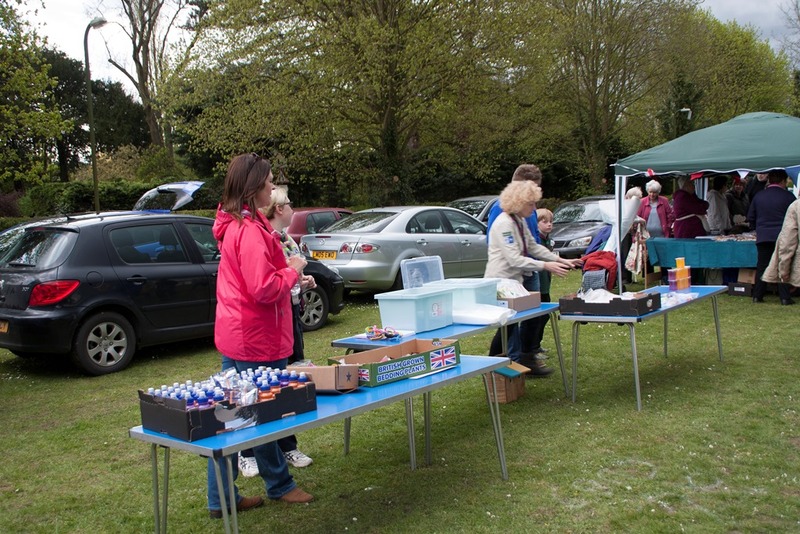 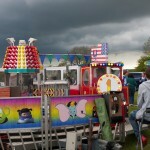 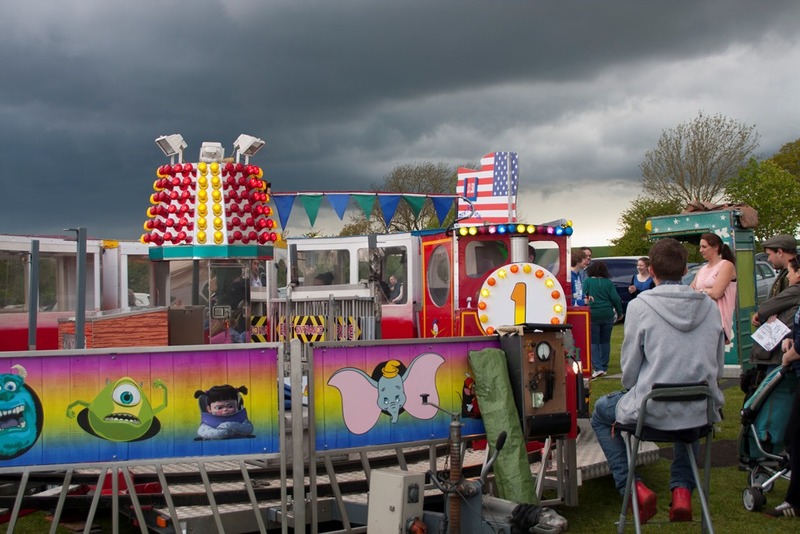 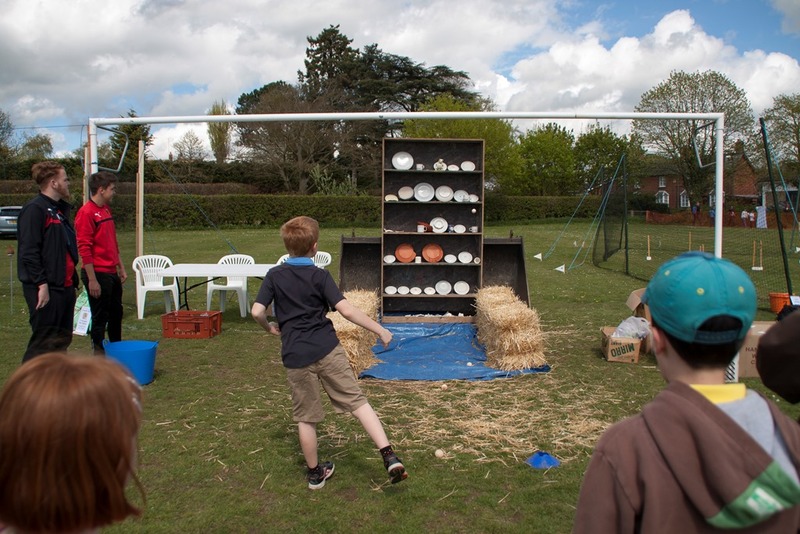 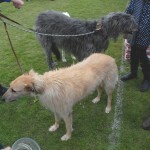 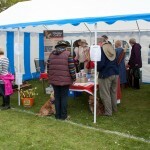 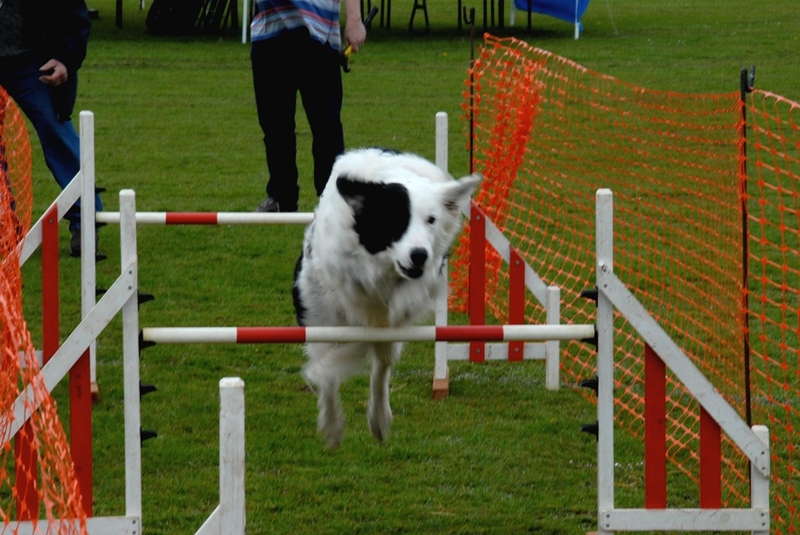 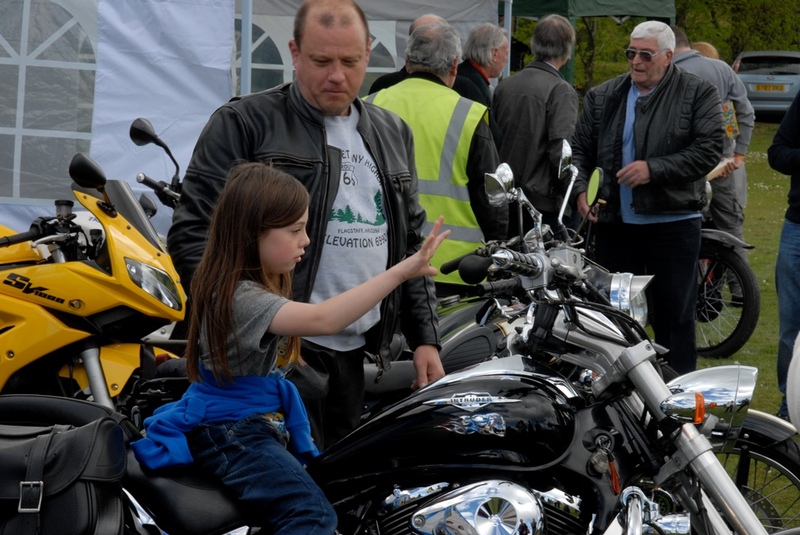 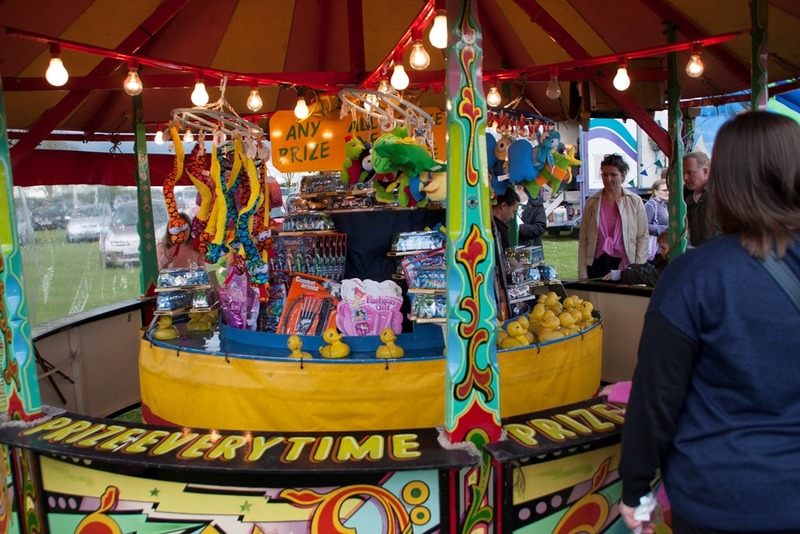 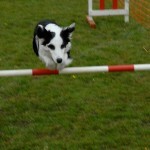 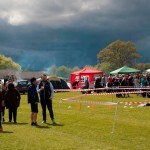 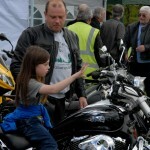 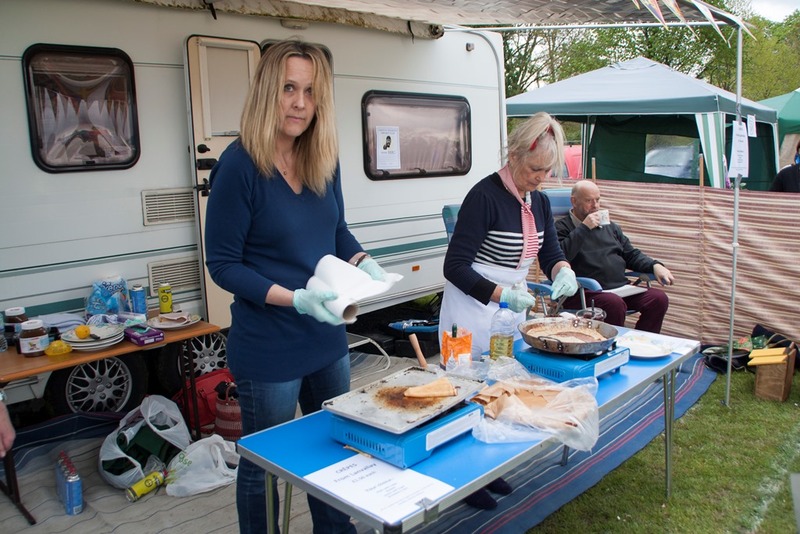 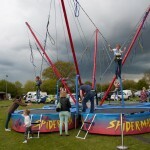 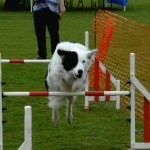 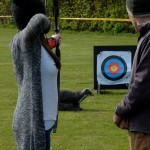 Organised by the Walkern Fair Committee, there was a wide range of attractions run by the village?s community groups, plus the ever popular dog show run by Heathlands Animal Centre.